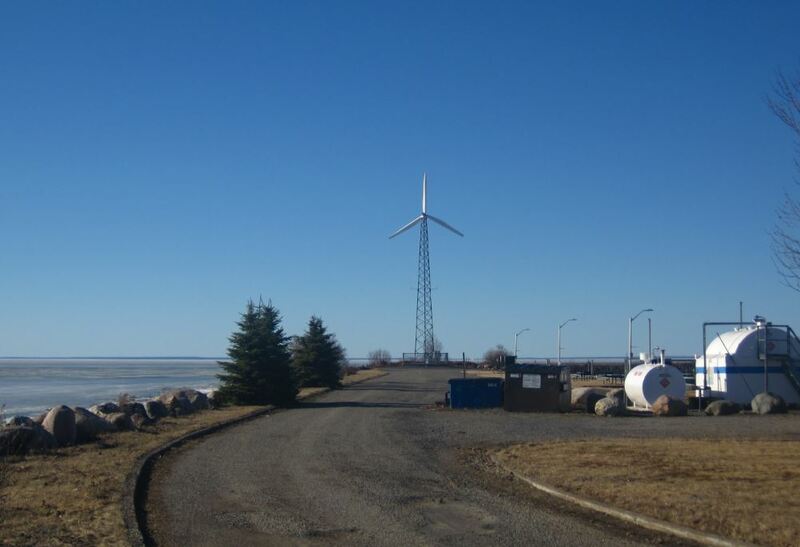 They have this stupid windmill located on the lake shore. Of all the times we’ve been here, not once, have we ever seen it working. Ever. 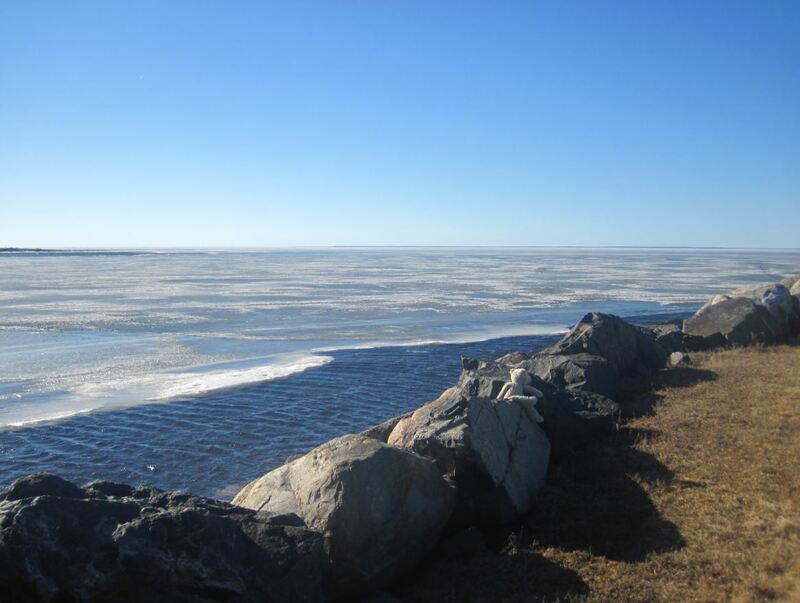 Frozen Lake Superior. 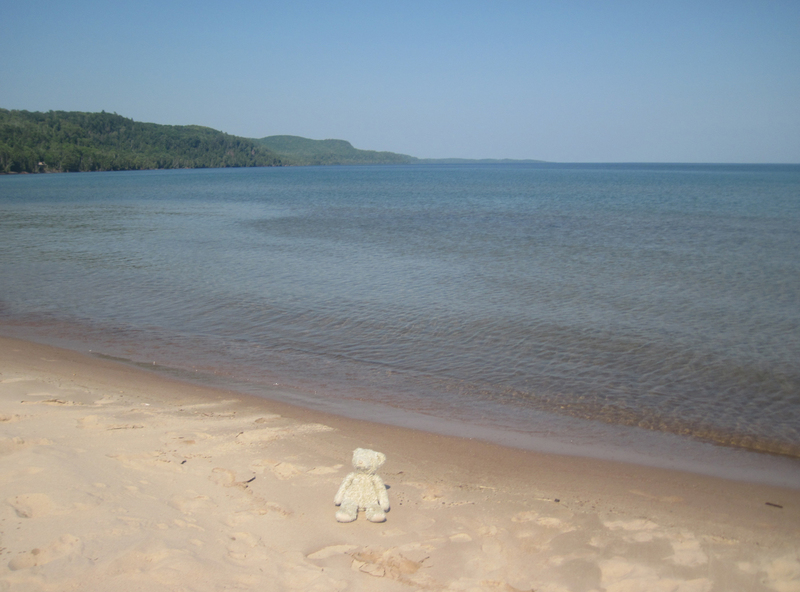 Junior sees two Great Lakes in one day. A Mom with her kids was on the beach. 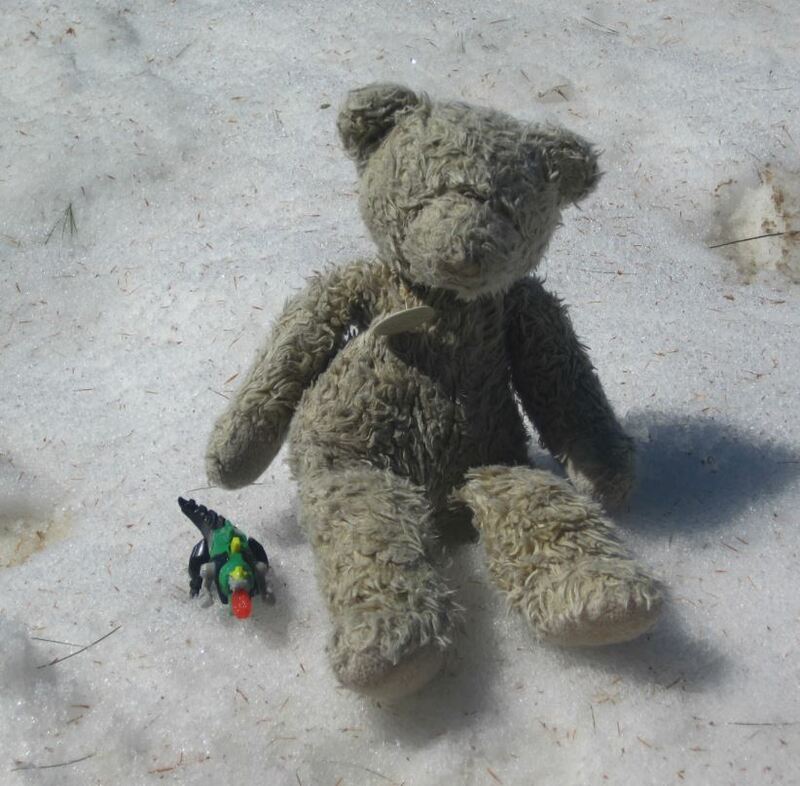 Her five year old son wanted a photo of his toy with Junior. It was some kind of dragon that spat our a plastic flame, from a McDonalds Happy Meal. I asked the kid what the toys’ name was. He said it didn’t have one. I suggested “Clem”, but the kid shook his head “No”. Then I suggested THUN-DAR and he agreed. So here is Junior with THUN-DAR. 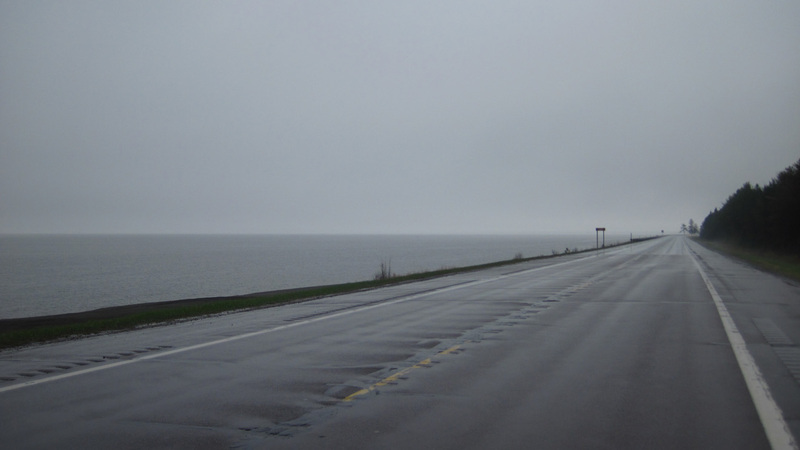 This is last view of the lake you get from the highway, until you get to Marathon, another 200 km further down the road. Of course there’s a sign telling you not take any rocks with you. There is absolutely nothing here except some houses Not even so much as a convenience store. 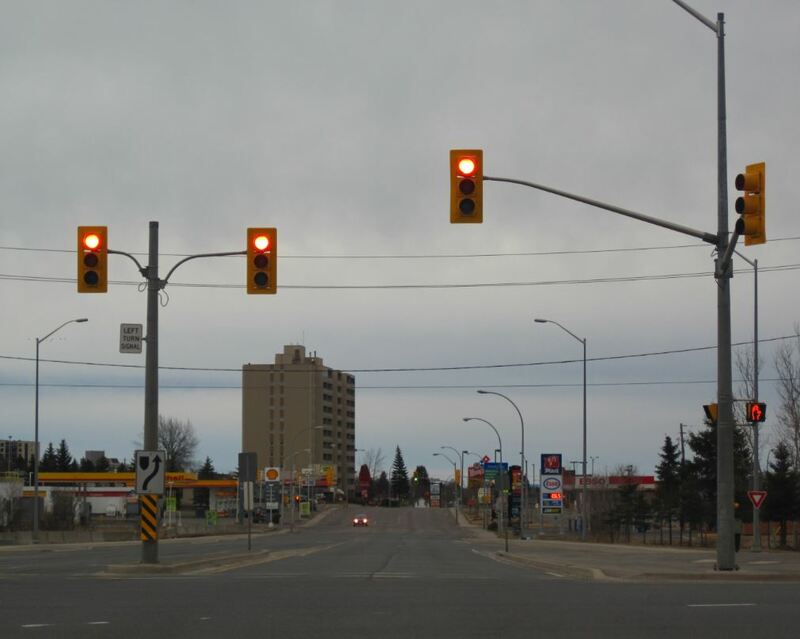 It was the first town with traffic lights since we left Sault St. Marie. 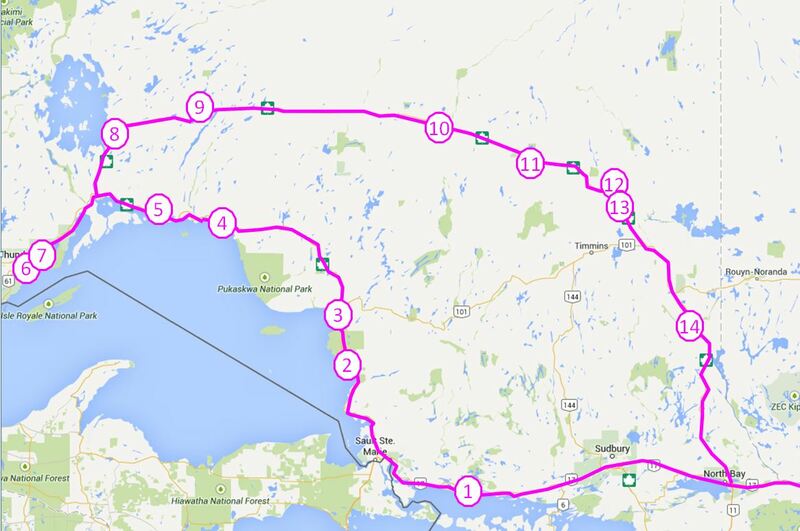 He ran the equivalent of a Marathon every day, from St. Johns Newfoundland to here. 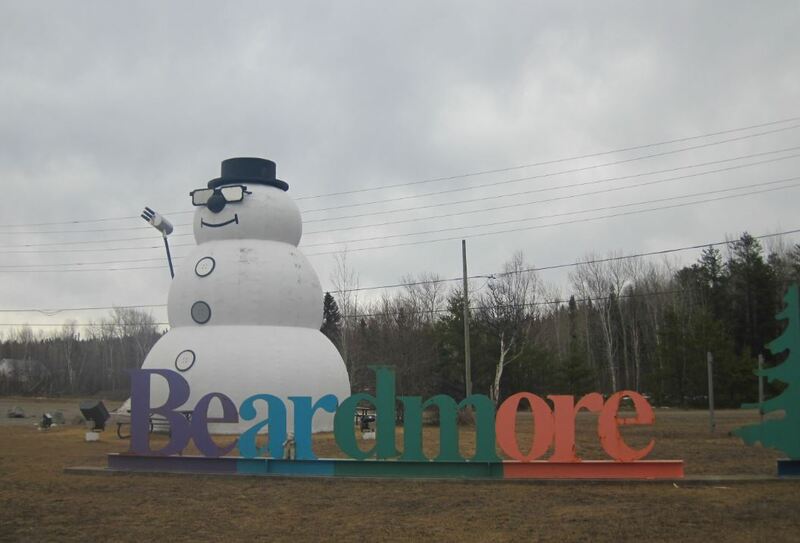 This is the only thing the town had going for it: a giant snowman. Junior was pleased that he was sitting in the “BEAR” letters”. Sunday morning, at 11:00 AM. This was one of the “bigger” towns in the area. So we tried to find a single restaurant that was open. With no success. Where do people here go to eat? There wasn’t even a truck stop. Big Critters. Junior made some friends. 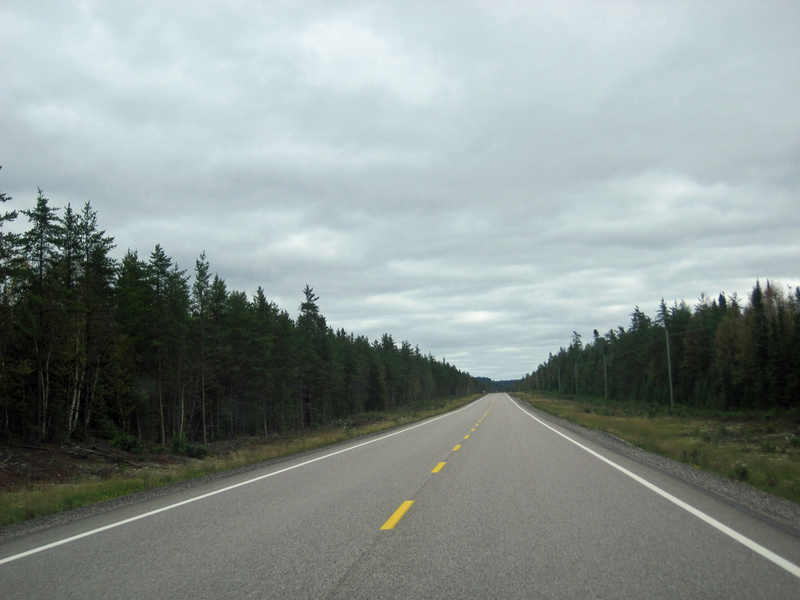 Since Thunder Bay, this was the longest stretch of paved road (500 km) we have ever seen without a single McDonalds or Tim Hortons. 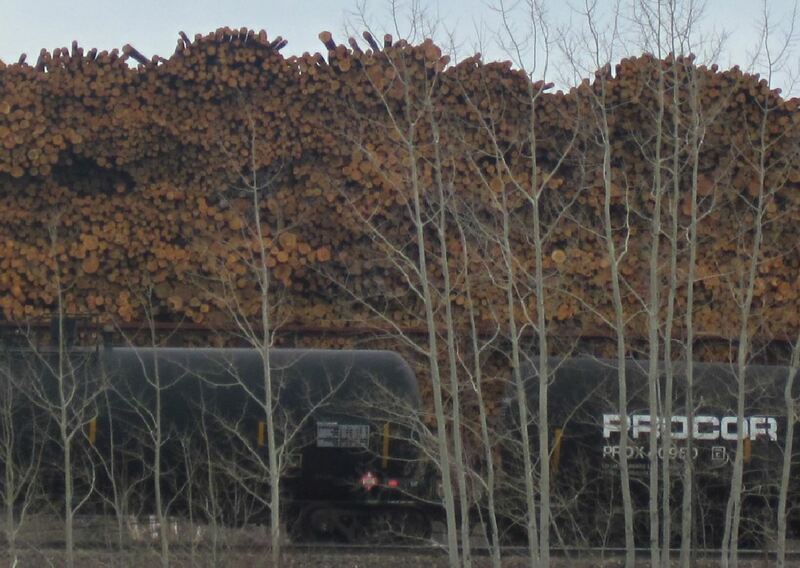 There was also the biggest log pile we have ever seen. Everything is always better, when you got UFO’s. Please note: DO NOT CLIMB. 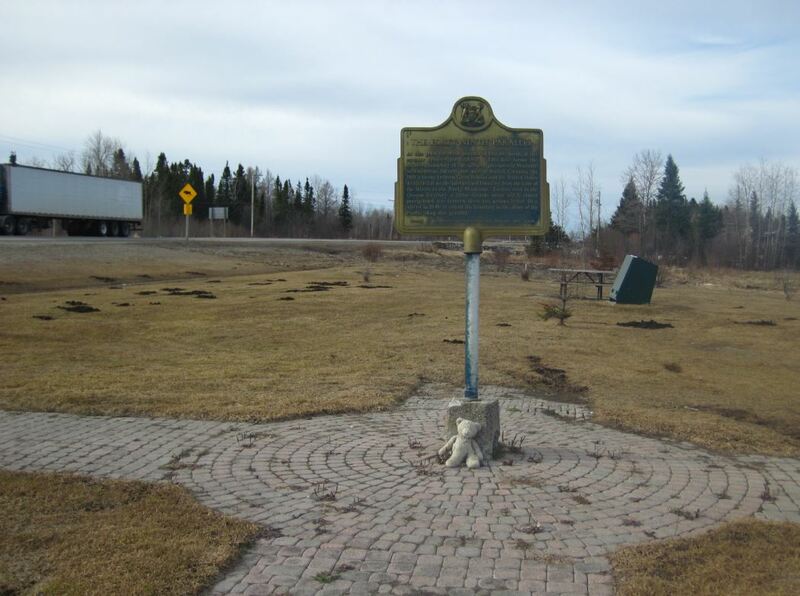 This is just about the saddest road-side attraction I have ever seen. His name is apparently “Earl”. 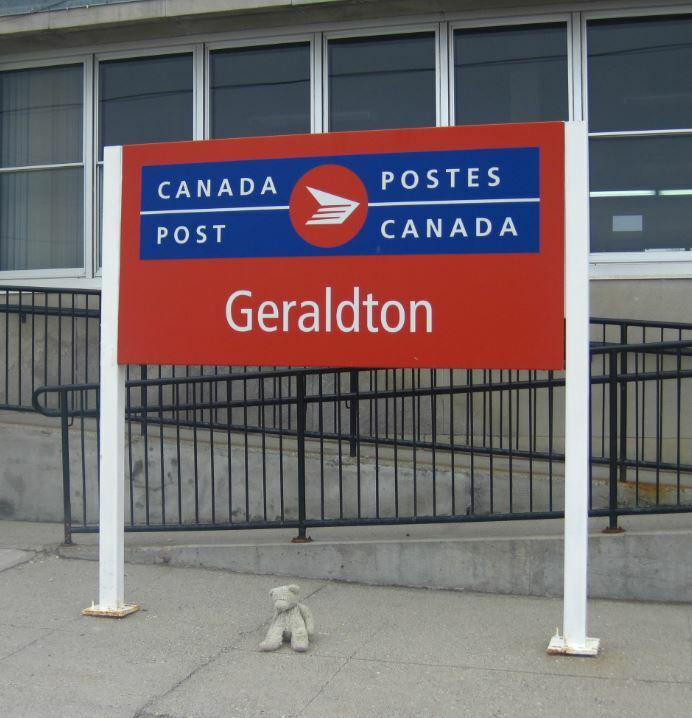 Maybe being next to Earlton has something to do with it. 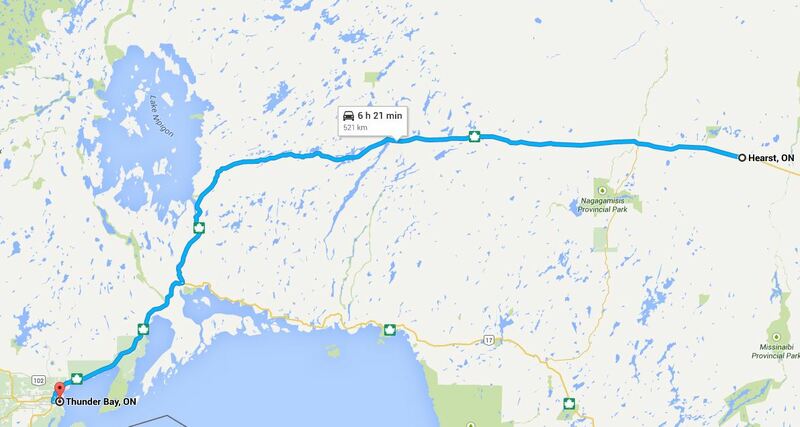 All in all, we drove more ~ 2700 km. If this had been the UK, we’d have driven a big chunk of the entire country. Different Faces of Superior on a Rainy Long Weekend. 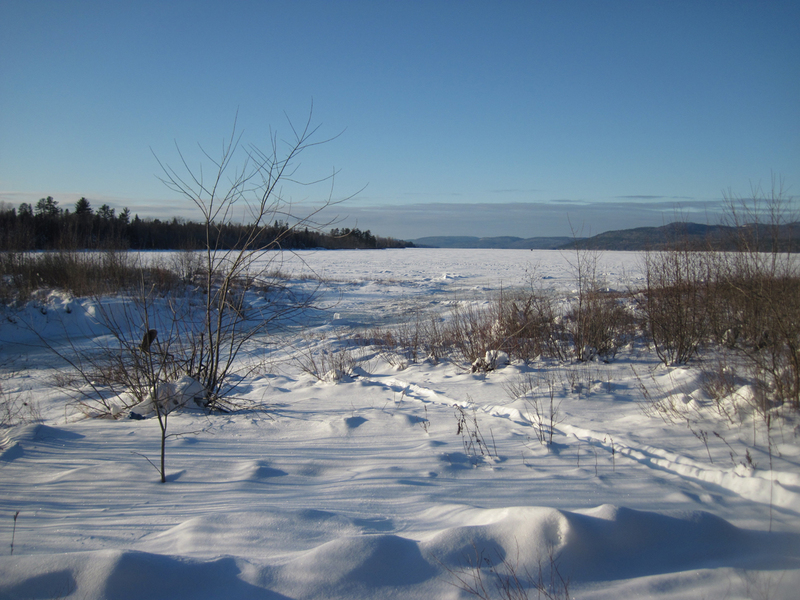 Saturday, just north of L’Anse. Kind of a miserable day. Sunday morning. 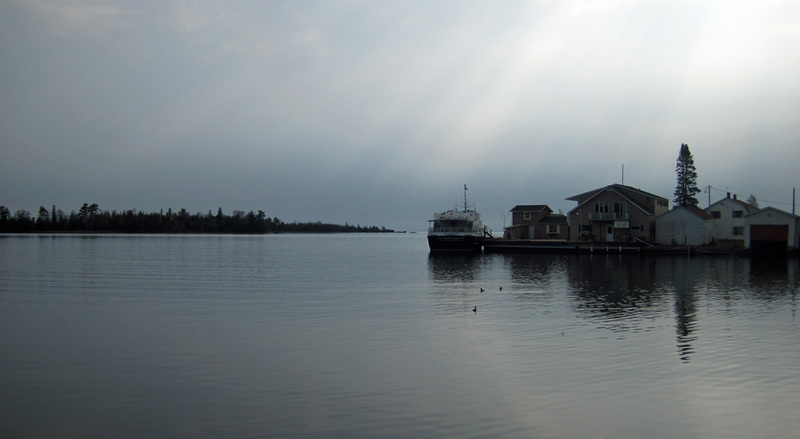 That’s the ferry to Isle Royale, though I”m not sure if it was running yet. The day was calm, but you could hear thunder coming from the dark clouds on the far horizon, so low in frequency as to barely be audible. Just ~ 10 miles down the road from the fishermen. Cold and damp…it was 48F. But an hour later, just 40 km to the south at the town of Laurium, it was in the mid 70’s. Later that same day. It was warm, sunny and calm, almost summer-like. It was a totally different lake. Needless to say, this was off-peak tourist season, and I had the entire place to myself. 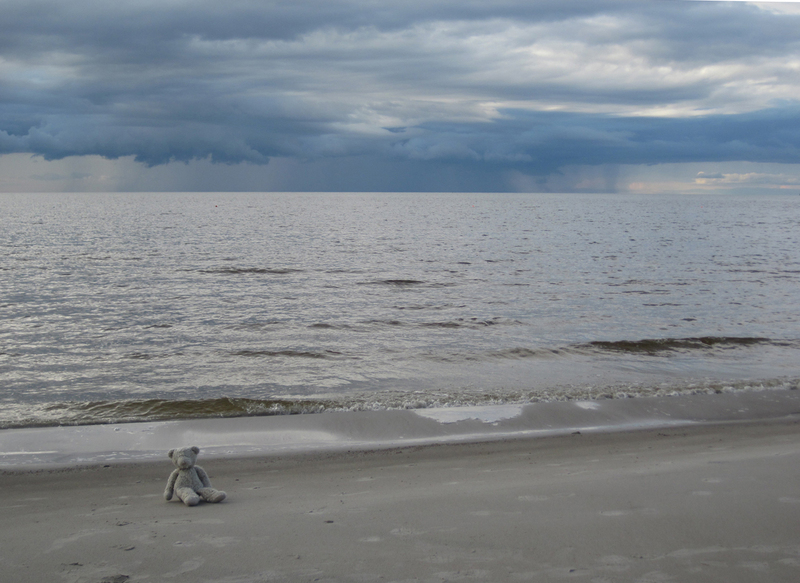 A storm was building on the horizon again, and the water had a greenish grey hue. Exact same location, just facing East instead of West. 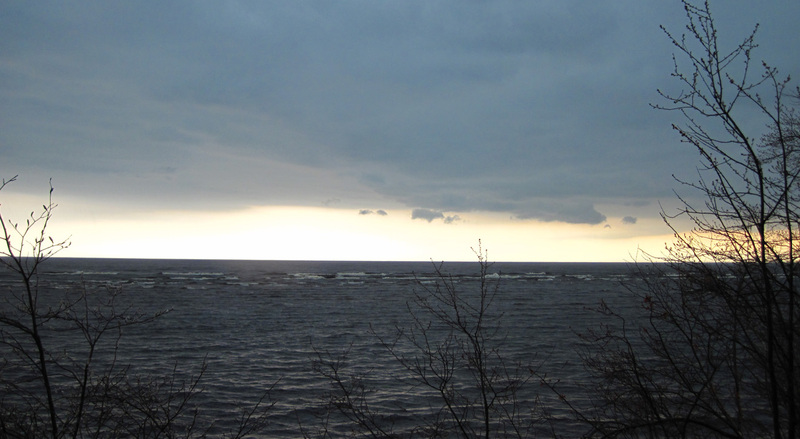 It’s amazing how much the lake can change, even just by turning around 180 degrees. A small beach town on the lake, though nobody was really there this time of year. I didn’t get out of the car much. The storm had caught up with me and it was a torrential downpour. Later Monday afternoon. Close to where the wreck of the Edmund Fitzgerald happened. 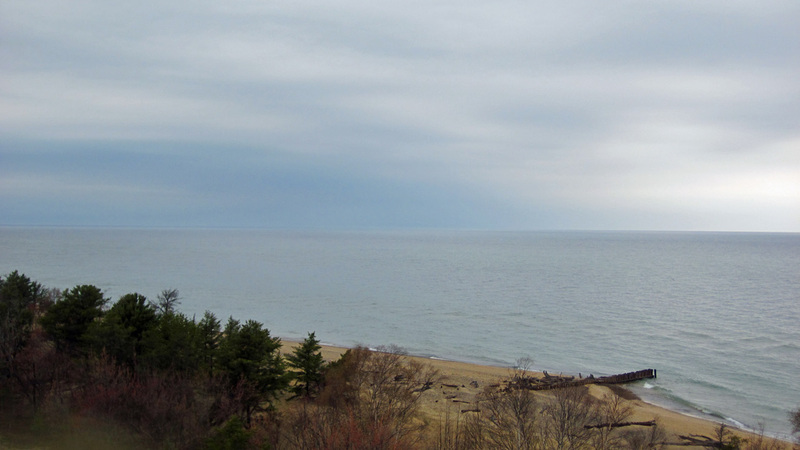 This view is from the lighthouse. Facing West…with yet another storm building on the horizon. 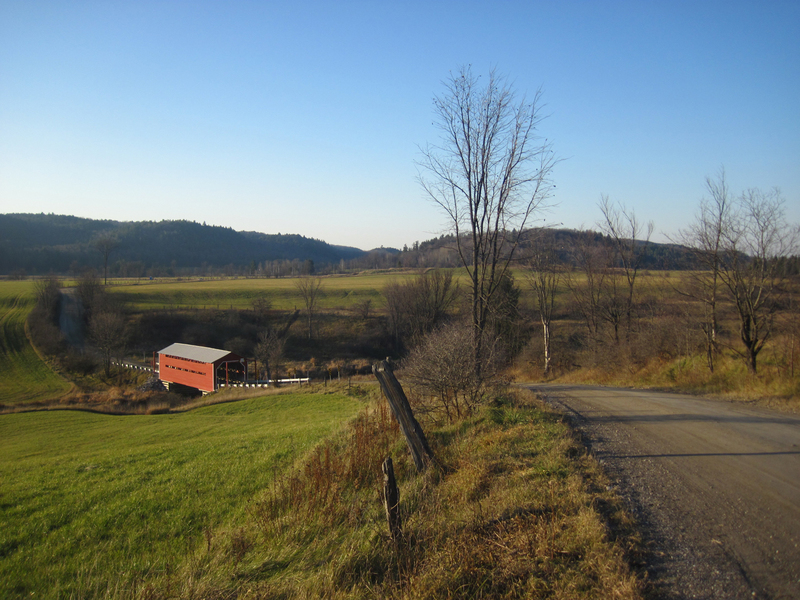 Facing east, just south of the town of Paradise. Though it didn’t feel like paradise that day. 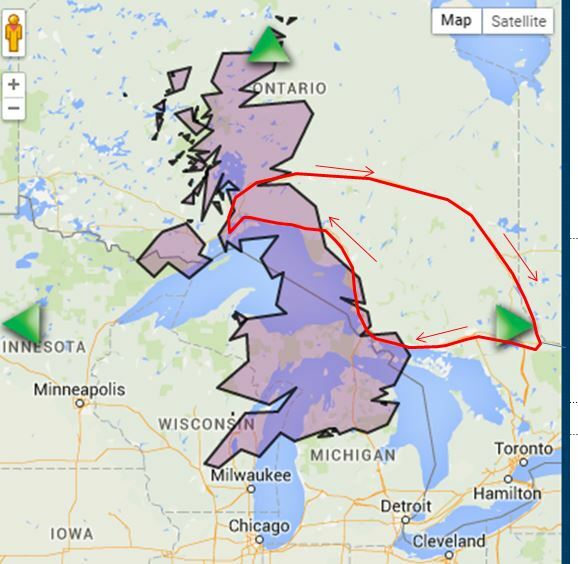 Superior was being a real witch, and the storm system followed my for 500 km on my drive home. This is why I hate watercolors. 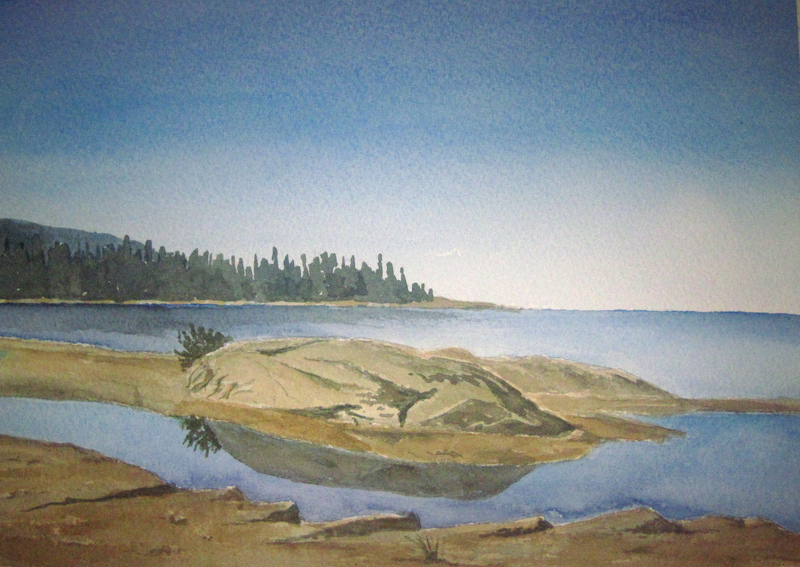 Just finished off a painting tonight of Neys Provincial Park (on the North Shore of Lake Superior). I spent a lot of careful time on this. I was feeling reasonably happy with this my work, until it was time to go home, and I noticed a bright blue smudge on the left. Some blue pigment from one of my tubes tube had inadvertently gotten onto the paper. I tried lifting it, but it was too late. The damage was done. Well, at least the stain wasn’t smack in the middle of the painting, or two entire evenings would have been completely written off. 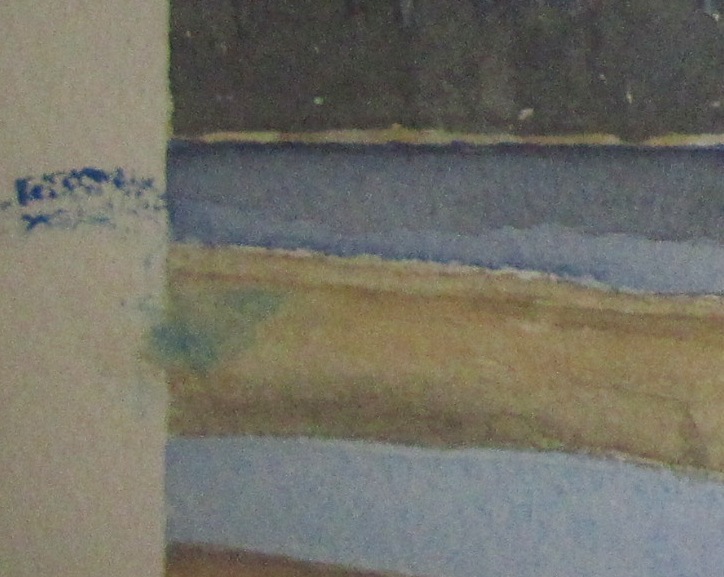 But if I crop off 1/2 an inch, the painting is still salvageable. I got off lucky this time. But still…it’s not quite the same. I”m bothered by this. 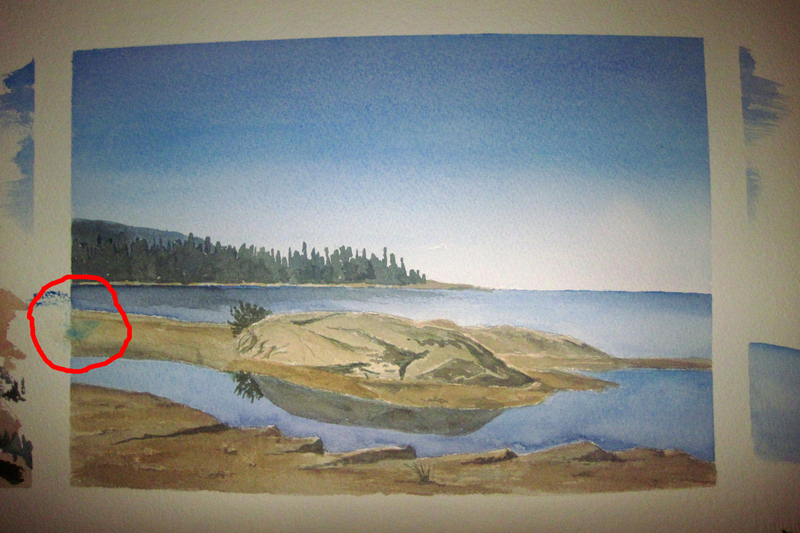 This is why I HATE watercolors sometimes. 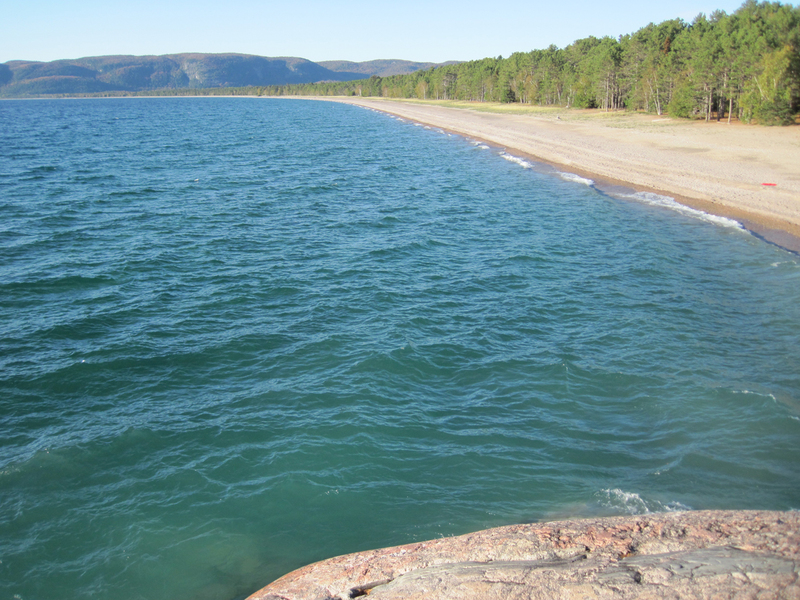 Located in Lake Superior Provincial Park, right off Highway 17. Nice long sandy/pebbly beach. Not too crowded, even in peak season. If you go there after Labor day it’s pretty much empty. 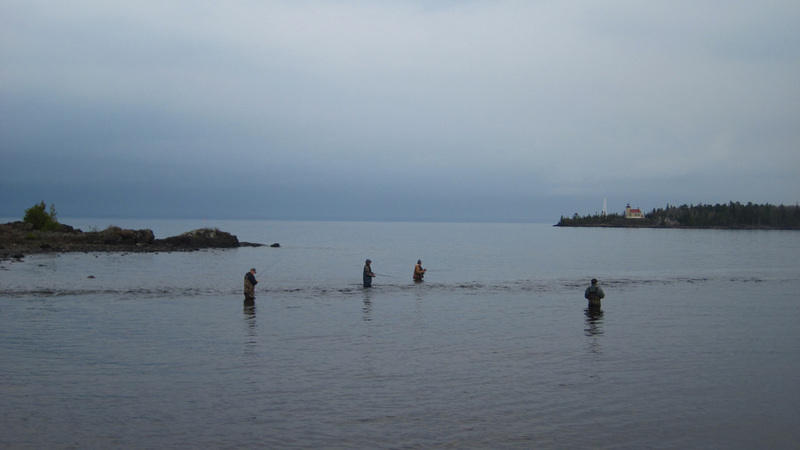 The water is cold early in the season, but it’s shallow and warms up nicely. 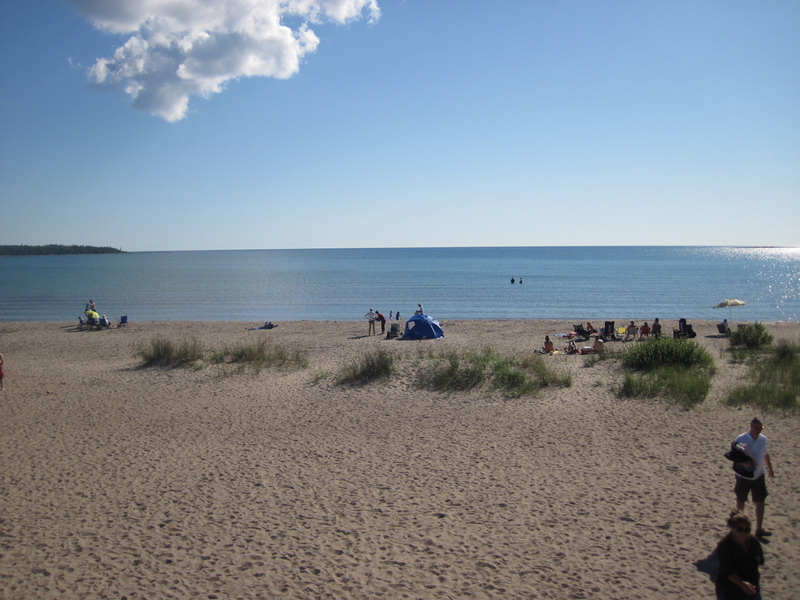 Towards the end of August, I find it’s one of the nicest swimming beaches on the lake. 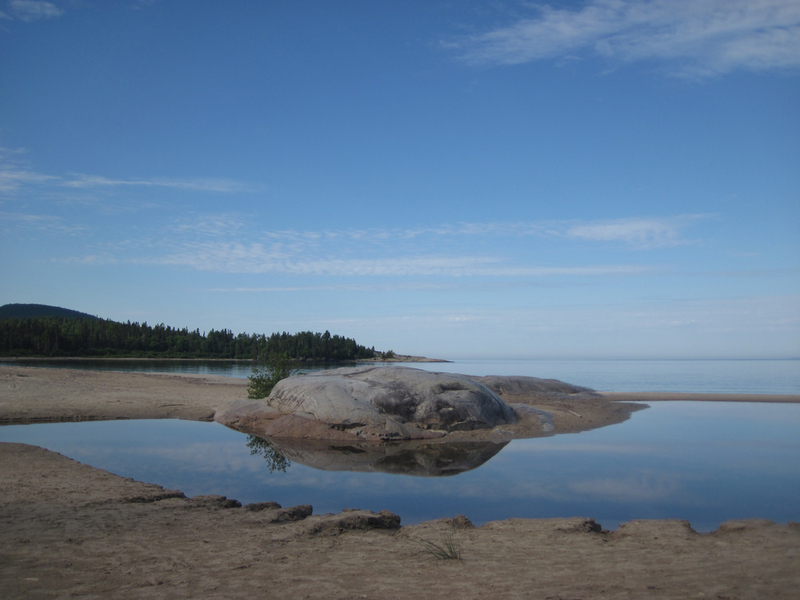 To get here, you have to exit Highway 17 and drive on a gravel road for 15 km through the bush. This is one of my favorite quiet areas, away from the crowds. It gives you a good sense of remote wilderness. Even in peak season, you might be lucky to see a couple of other hikers or kayakers here, and that’s it. 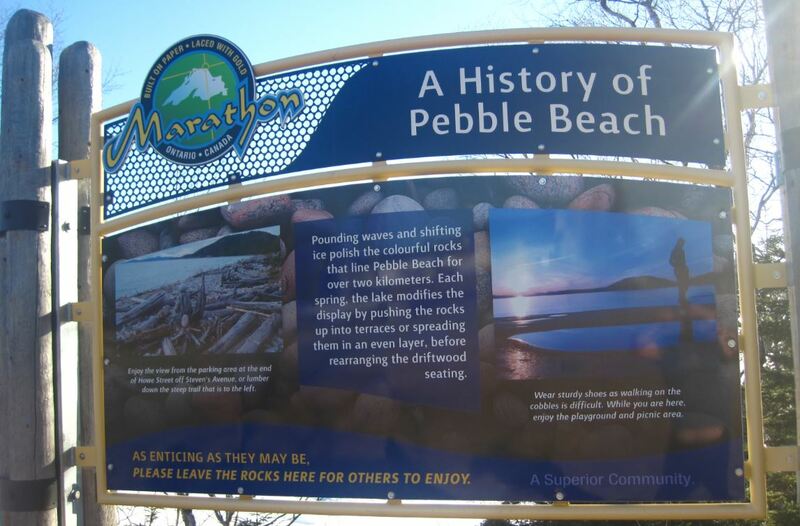 The beach is very rocky with big round pebbles, and not really good for swimming, though. The water is deep and cold. It almost looks too dangerous to go into the water here. 3. 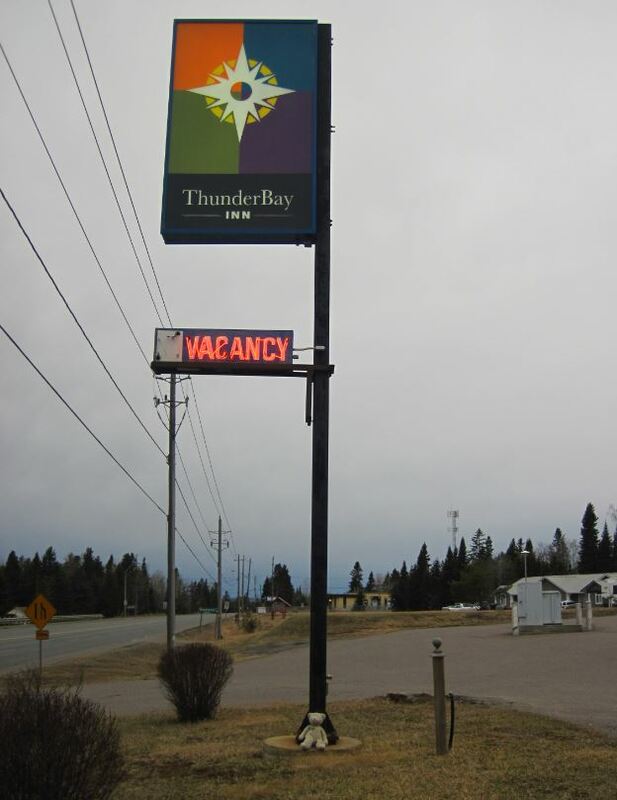 Old Womans’ Bay, Ontario. Nice little cove, with sheer cliffs and sandy beach, just south of Wawa. Sea kayakers enjoy this area. I always stop here because it’s right off the highway and it’s a quick photo op. The water is deep and cold, though. I once dunked my head here in May, but I don’t usually swim here. 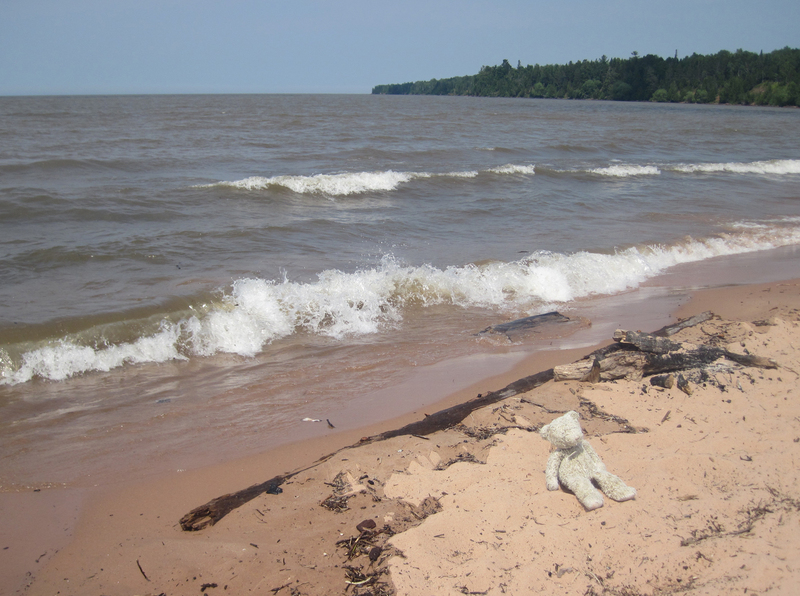 Junior Bear’s Rating: 7 out of 10 (due to poor swimmability and close proximity to the highway). 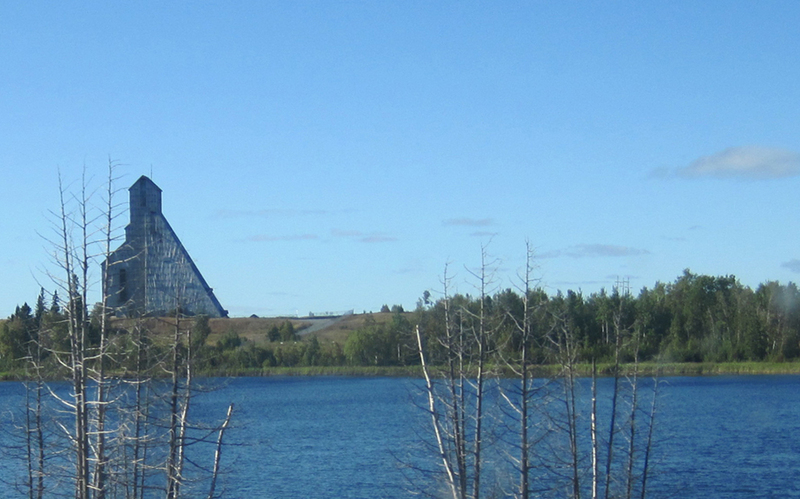 Located a few km off Highway 17, just outside of Michipicoten. This is one of my favorite beaches. It’s sandy and quiet. 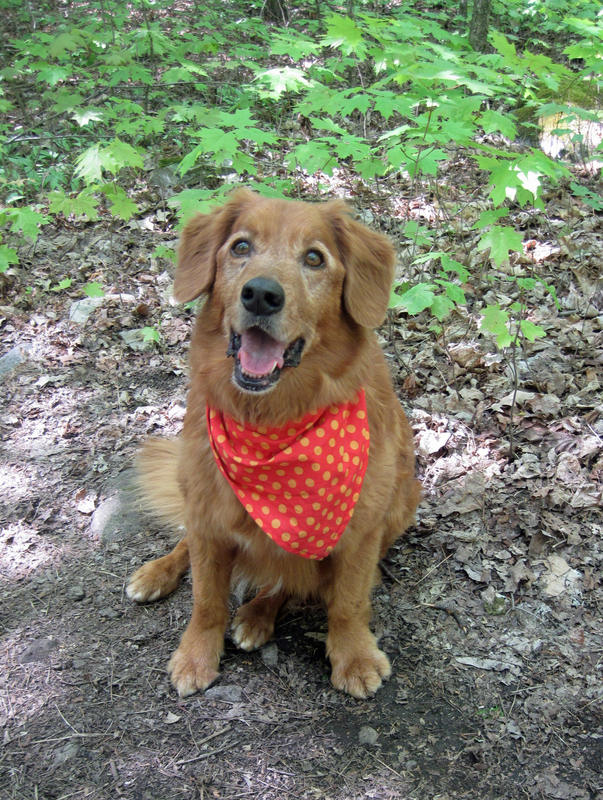 Even on a summer long weekend, you can have the place almost all to yourself. It’s a great place to come in the evening and relax and just listen to the lake. This is where I get my “Zen Like” moments. 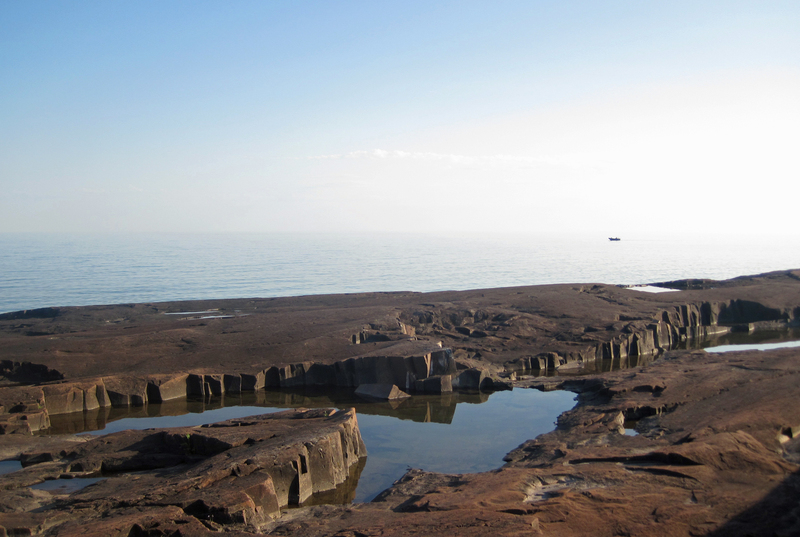 This is a special part of Lake Superior. 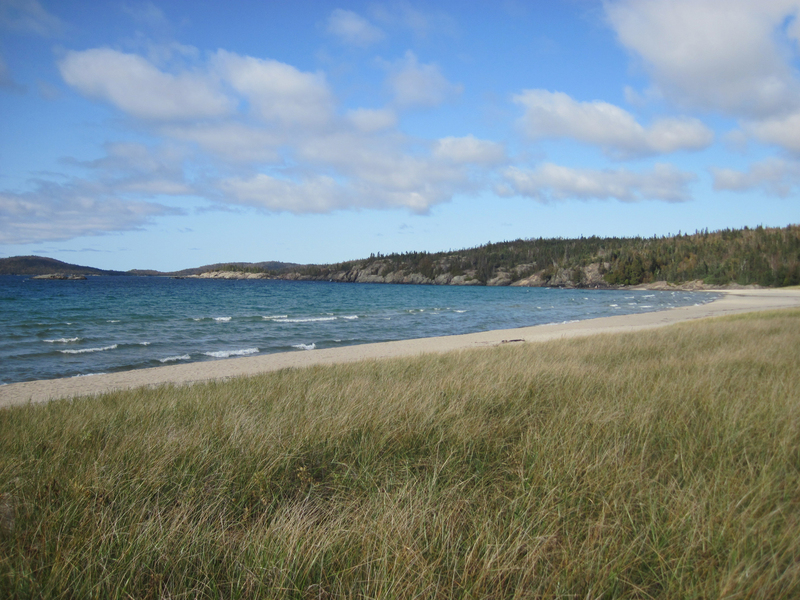 Just west of this beach is a long tract of roadless wilderness. For about ~ 150 km there’s nothing but pristine shoreline with no towns or cottages or road access. 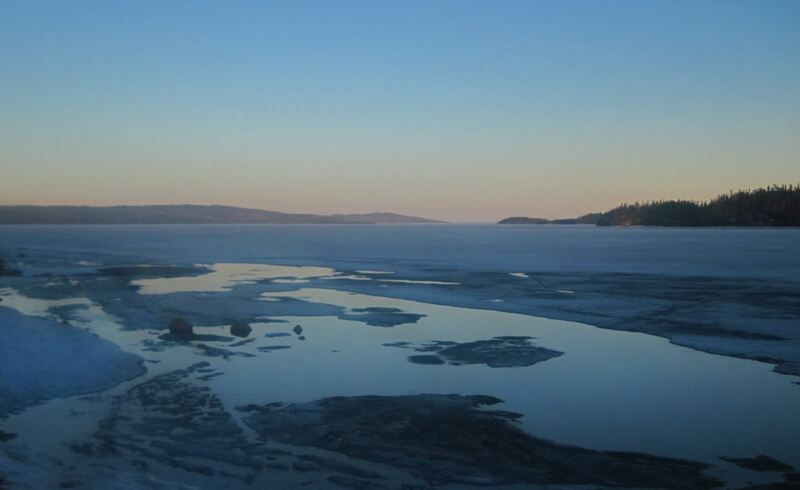 It happens to be the longest undeveloped freshwater shoreline in the world. 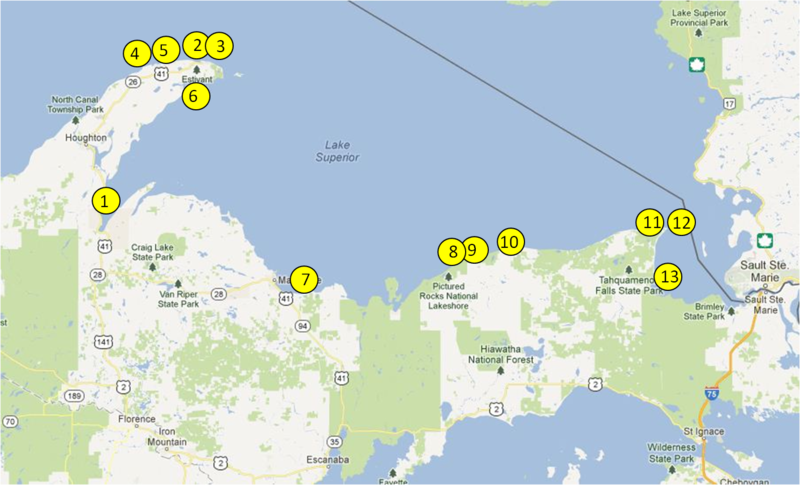 This is what’s so special about Superior, compared to the other crowded Great Lakes further south. The water is cold and gets deep quickly. I don’t bother swimming in June or July, but towards the end of August you can probably brave the water. 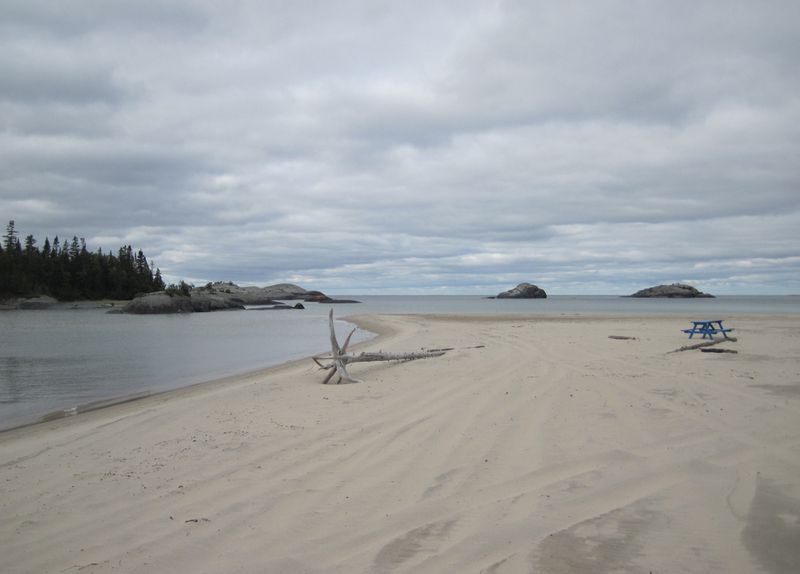 This beach is found just outside of Marathon, Ontario, which is a pulp and paper town on the north shore. This is definitely NOT a swimming beach. 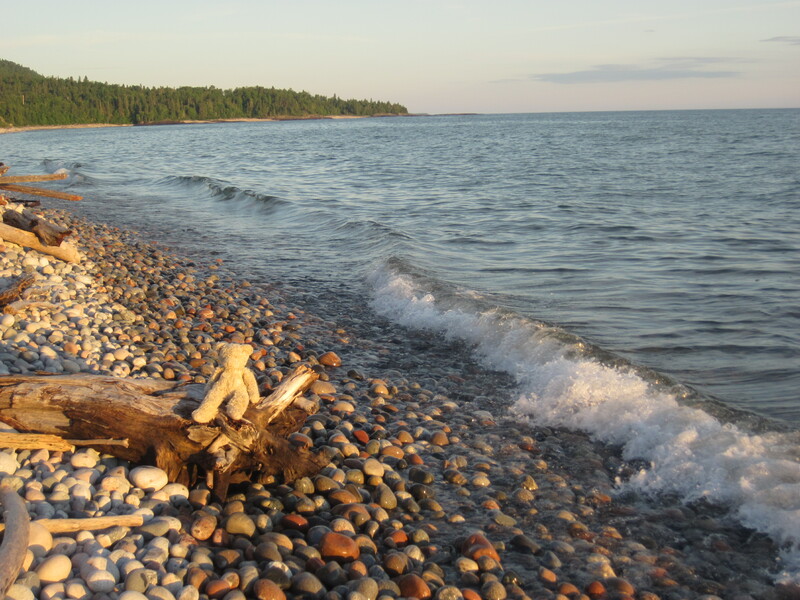 It’s strewn with football-sized pebbles and piled high with driftwood logs. You can hardly walk on the beach without risking a sprained ankle. The water is very cold, and gets deep very quickly. Again, this looks like it would be a dangerous place to swim. But there’s a certain charm to this area. It’s wild and untamed. 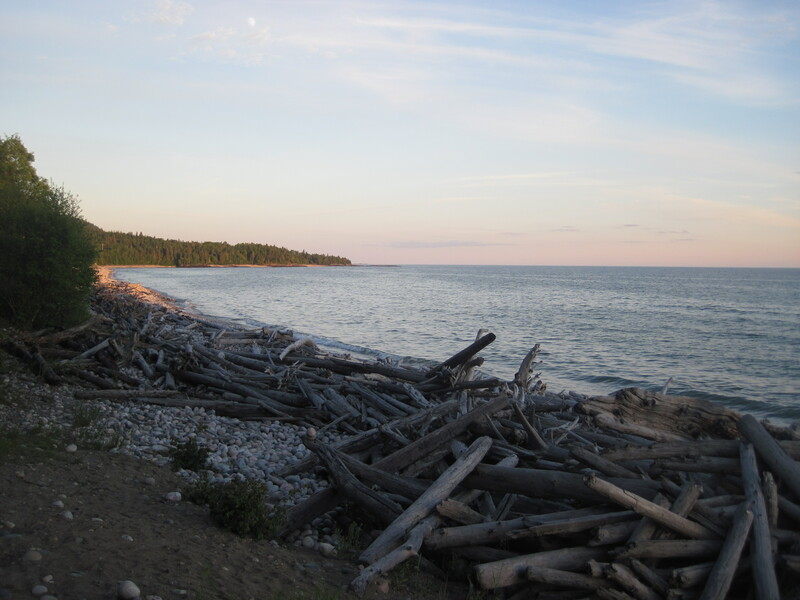 Outside the town, the shoreline is pretty remote, with no cottages or road access, just big tracts of wilderness on all sides. It’s one of those beaches that’s good for sitting and just contemplating the lake. I love the polished round granite pebbles. 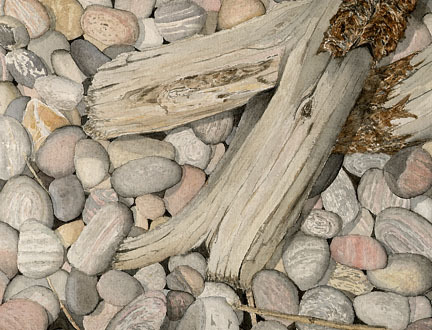 I once photographed some rocks and turned it into my all-time favorite painting. 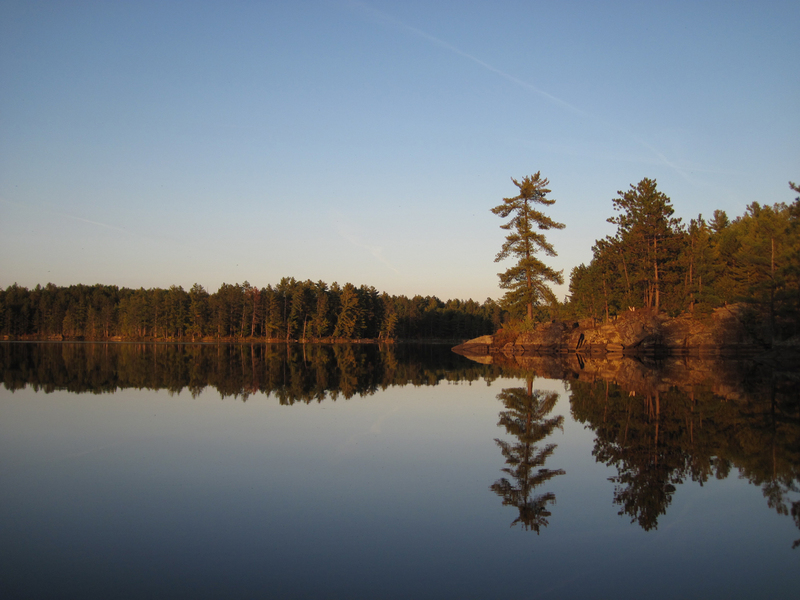 6, Neys Provincial Park, Ontario. 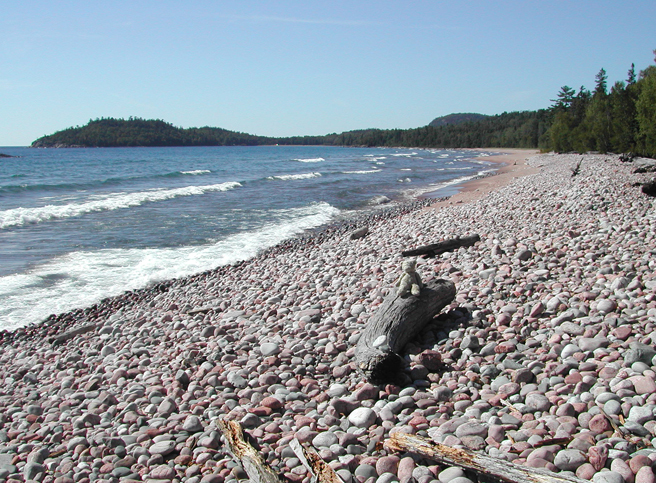 Located just west of Marathon, there are two parts to this beach. The first part is shallow and warm, next to all the campsites If the water is calm, it’s clear as champagne and very nice to swim in. 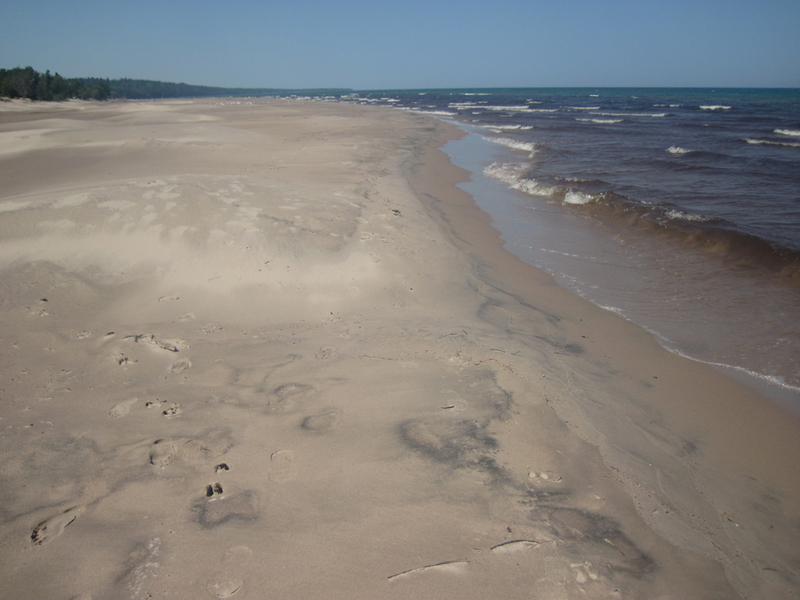 However, if the wind picks up, the water quickly gets muddy and turns brown. 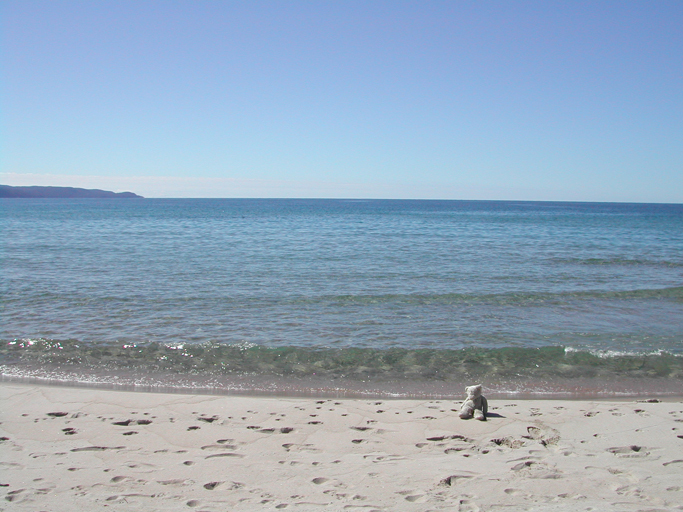 Here’s a photo of the beach on one of the rare calm days. 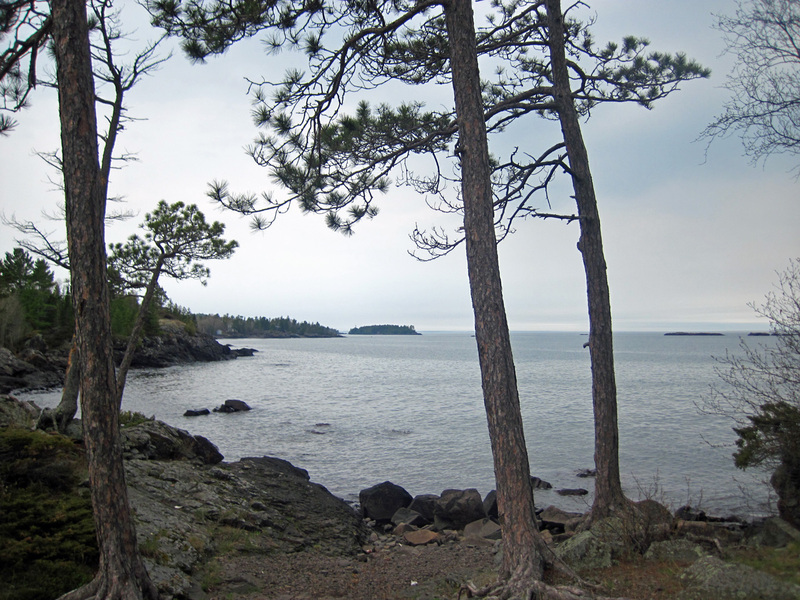 The best part of the shoreline can be found if you hike a kilometer east. 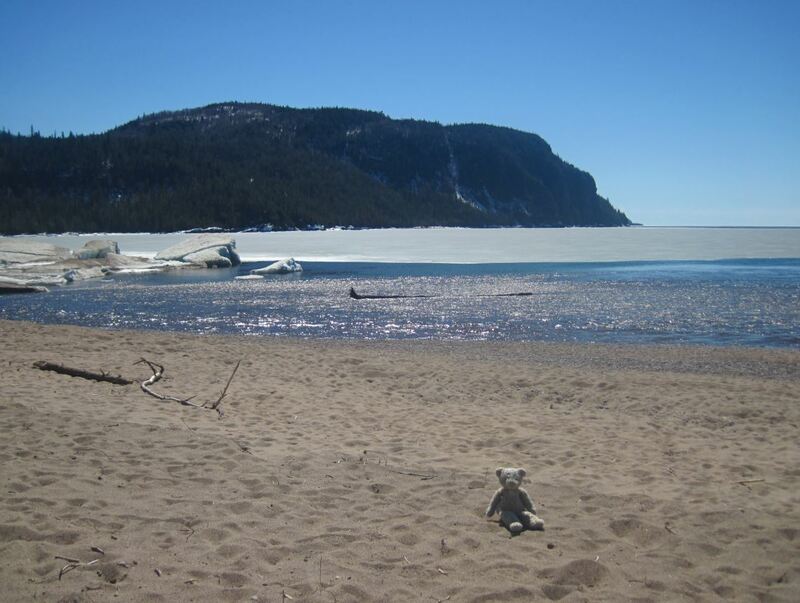 The sandy beach disappears and the shoreline transforms into solid bedrock, polished smooth by water, wind and glaciers. 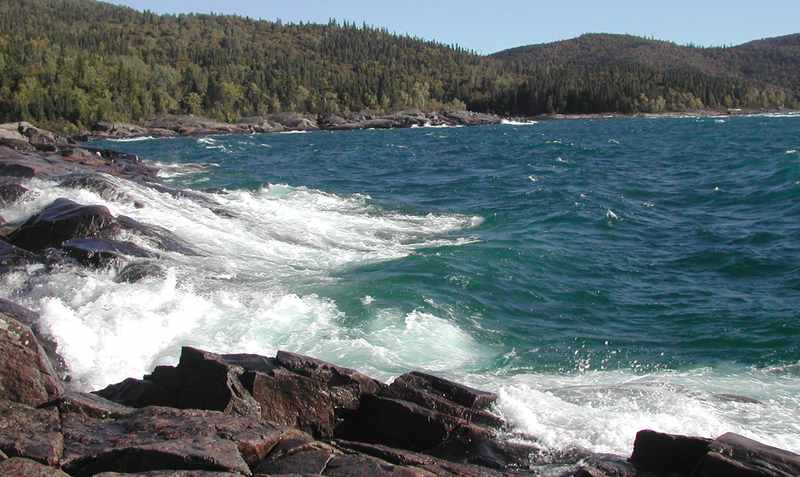 This is one of my favorite parts of Lake Superior. Rugged, untamed, and wild. This is the North Shore at its finest. I can (and have) sat here for hours watching the waves, which can get spectacular on a windy day. 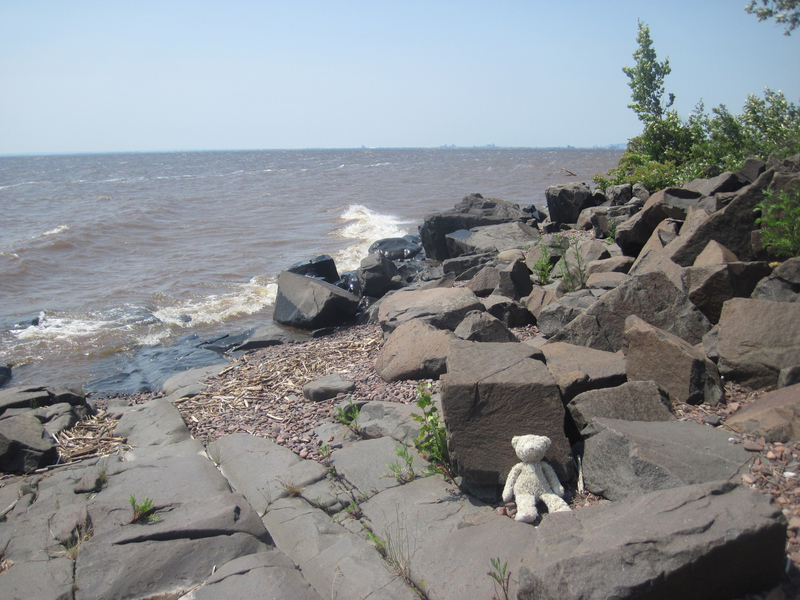 I’m sad to say, I found Minnesota had the least impressive shoreline. It was average/mediocre. No islands or rugged shorelines or long stretches of sand. Furthermore, Highway 61 pretty much hugs most of the coast, so there is very little shoreline that’s more than 100 feet from noisy traffic. 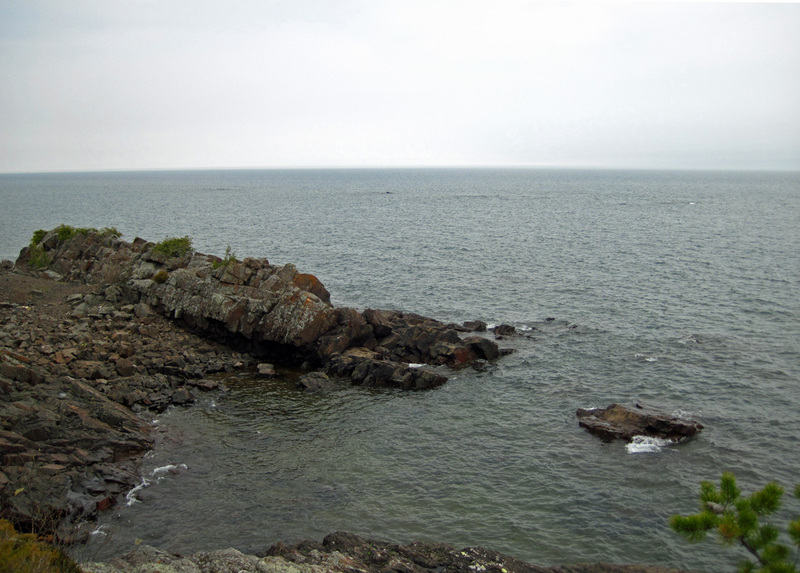 And most of the shoreline is privately owned. There is little public access. except for the occasional State park, boat launch or picnic area. But these are few and far between. 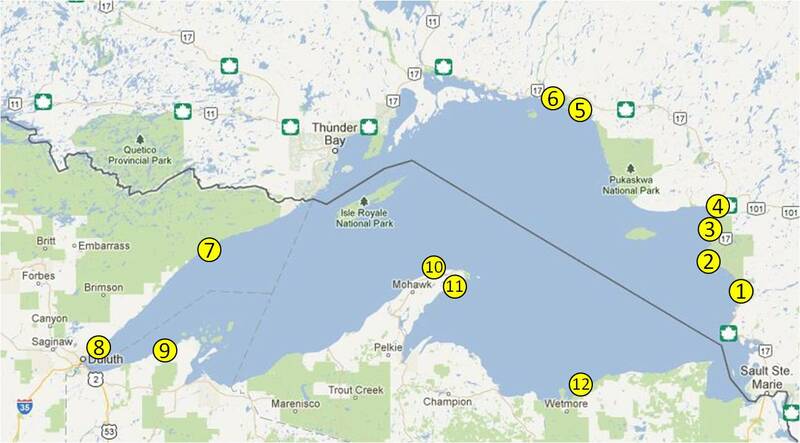 One exception is Grand Marais, which is one of the nicer areas. It’ s a quaint town with a big marina and a harbor, though it’s also somewhat touristy. There is no swimming beach to speak off. Just a lot of rocks. The water, however, is amazingly crystal clear, and very deep. In theory, you can jump in if you wish. I did, years ago, in June. All I remember was opening my eyes underwater and seeing green-blue, and thinking it was like being in a furnace. The water was so cold, it felt like my skin was burning. 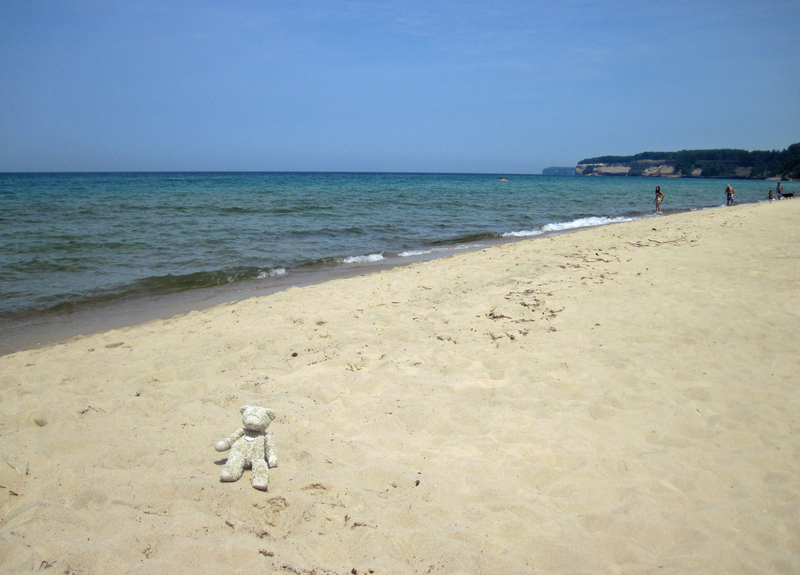 Junior Bear’s Rating: 6 out of 10 (because it’s not really a beach). 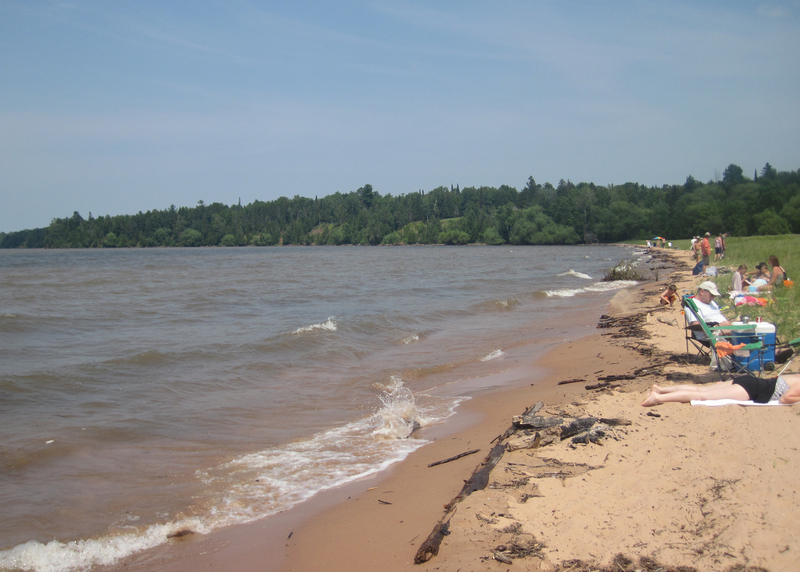 In my quest to find a decent Minnesota Beach, I kept stopping at the all the rest stops to see if I could find anything. 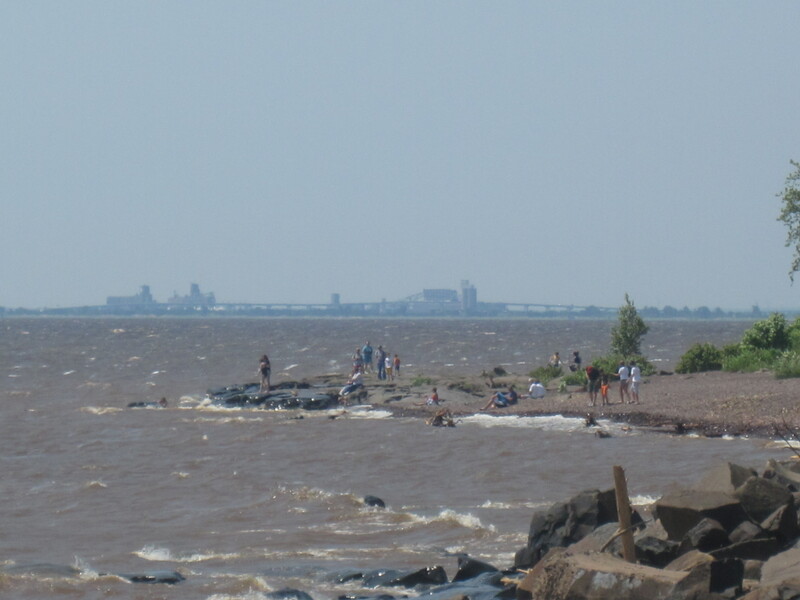 Here’s a typical one just outside the city of Duluth, which you can see in the background. 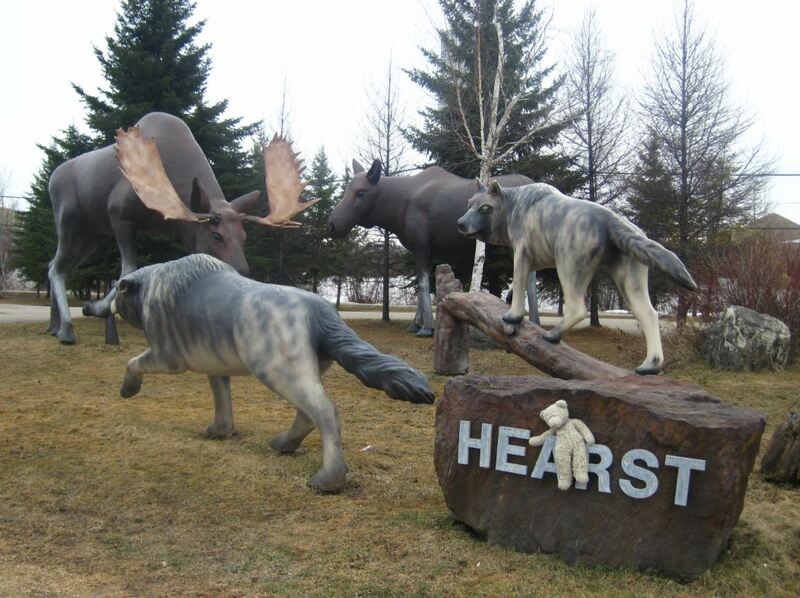 This was right off the old Highway 61. What a dud. There was almost no shoreline between the paved road and the water. Nothing but brown rocks with bits of twigs and wood and debris all over the place. Furthermore, it was a windy day so the water was stirred up to a silty, dirty chocolate-milk brown. Nothing you’d want to go swimming in, unless you wanted your shorts to fill up with dirt and junk. 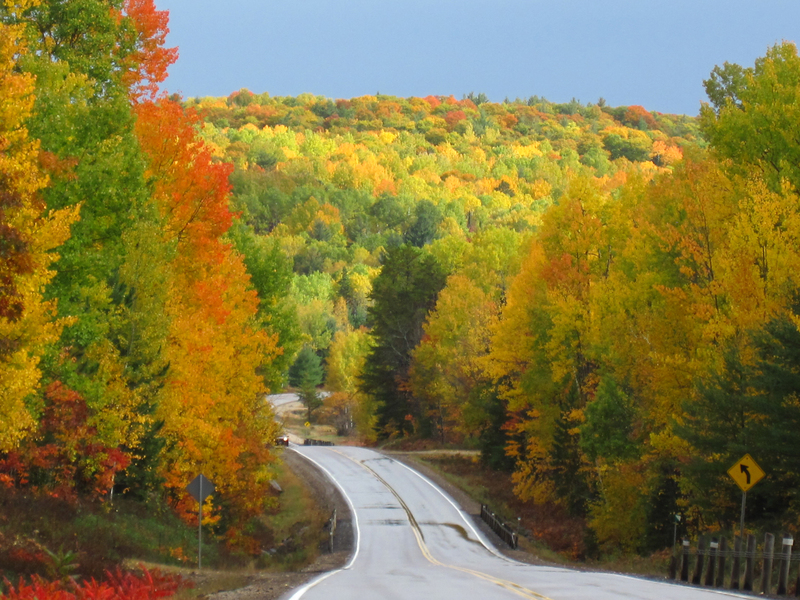 Located on the Wisconsin Coast between Duluth and the Apostle Islands. 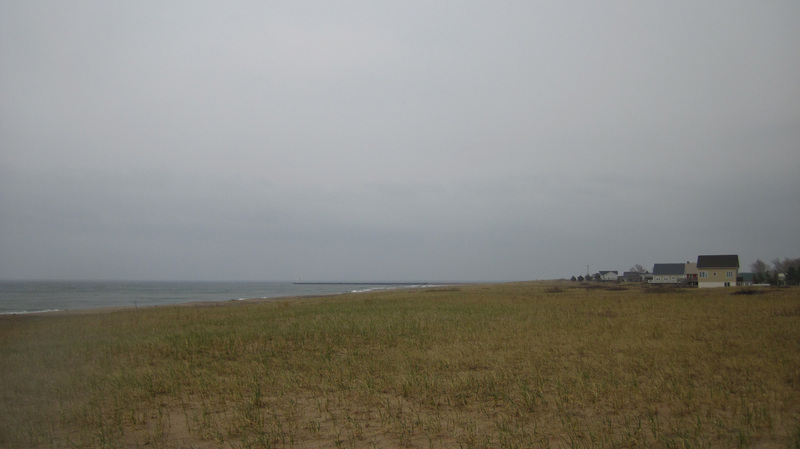 Again, this was an unimpressive beach. Nothing but a tiny strip of sand between the sand dunes and the water, where people were jam-packed. And once again, the wind had stirred up the water to a chocolate-milk brown. Nobody was actually swimming. Maybe I’m being too harsh. 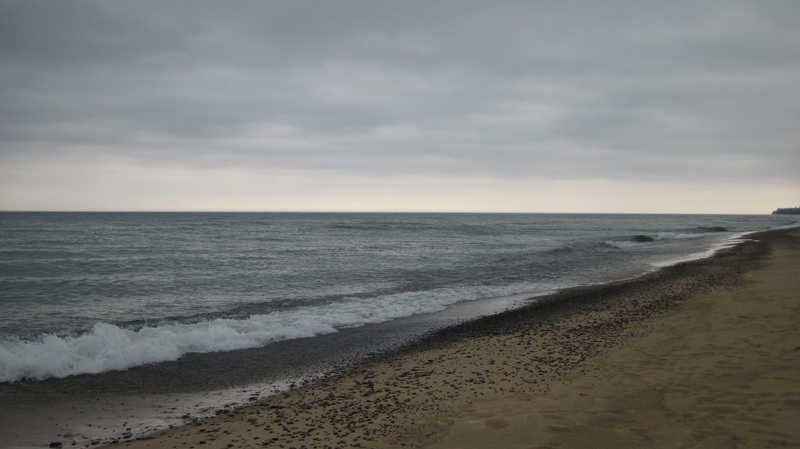 Perhaps I saw the beach on a bad day, when the water was unusually high and stirred up. Either way, based on what we’ve seen, Junior Bear rates this a 5 out of 10. 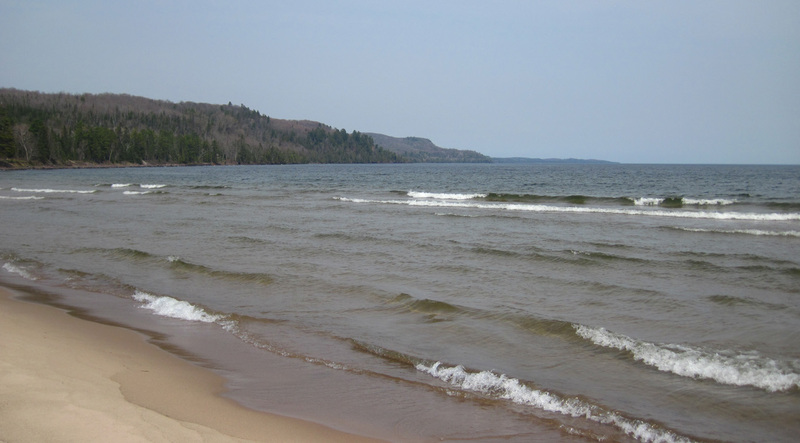 This beach is located on the western part of the Keewenaw Peninsula, which juts out ~60 miles right into the middle of the lake. 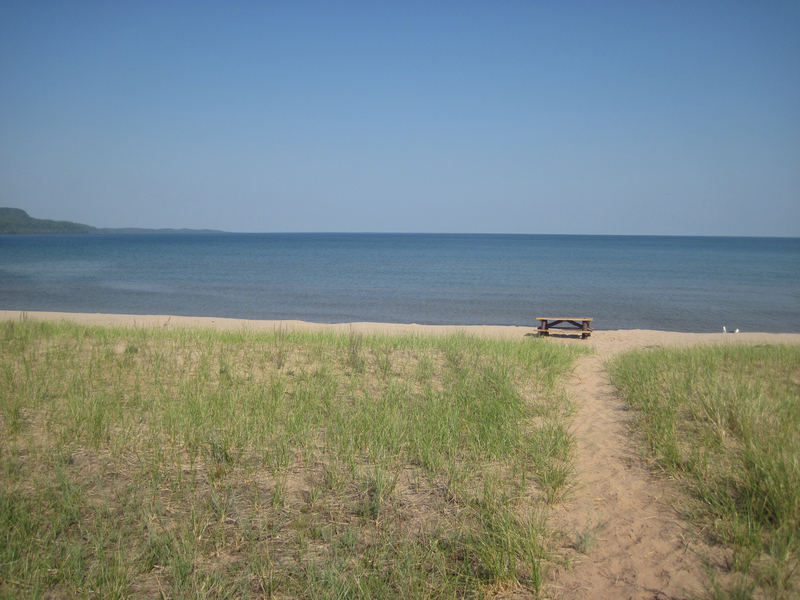 This beach was a delightful surprise, after the disappointment of Minnesota and Wisconsin. 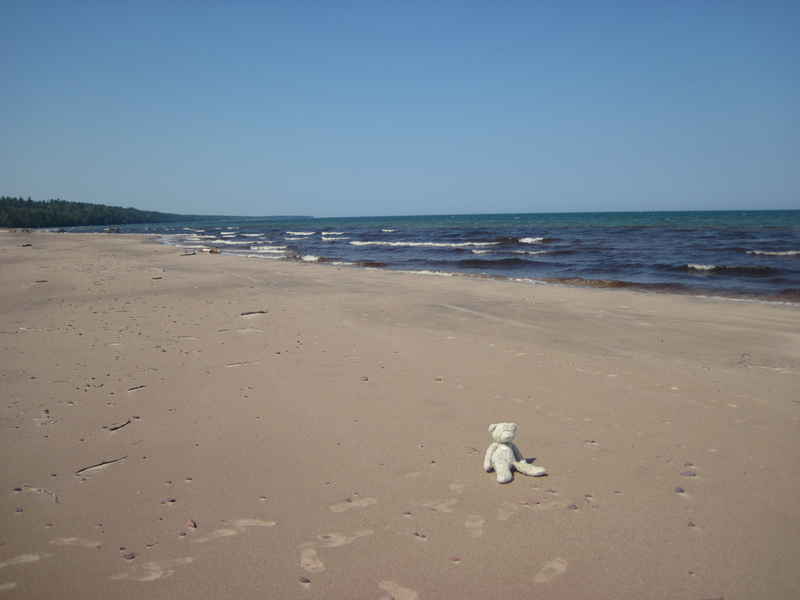 It’s a nice white sandy shore, with clear blue water, that goes on for miles and MILES. Granted, I was there on a weekday, but it was July 3rd, and I’d figured it would have been crowed for the American Holiday. But there was hardly a soul there. 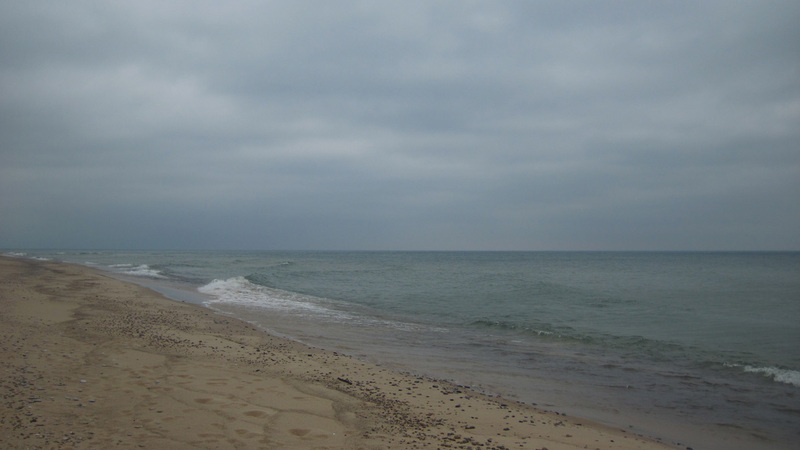 I didnt’ swim because the water was quit choppy, but I walked along forever, and the beach it just kept going and GOING. Yes, there were houses along the shore, but they were mostly tucked in among the trees, and there’s plenty of access to the water. 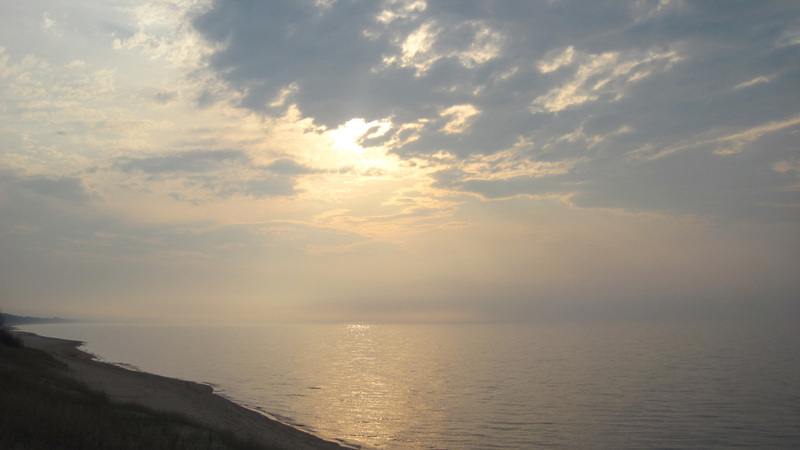 Michigan’s Upper Peninsula is out of the way for most people, so isn’t very developed. 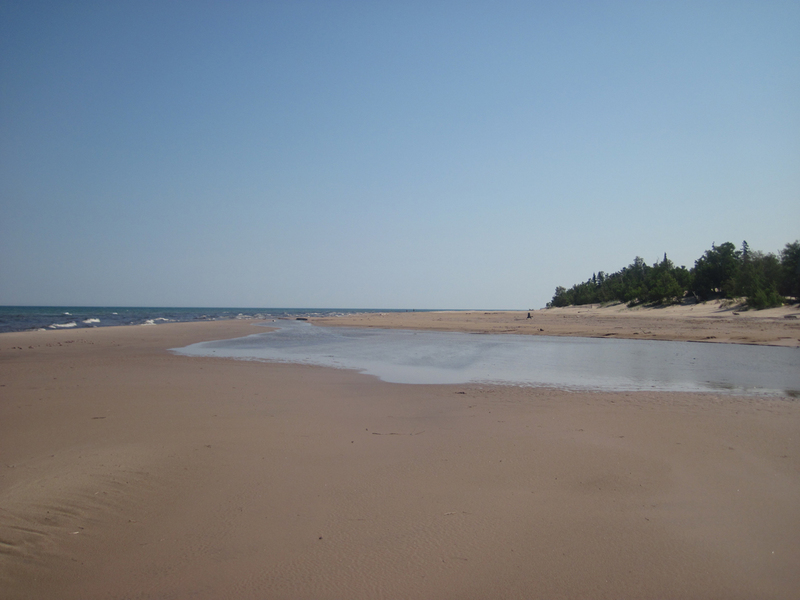 This is probably one of the few beaches where you can see deer tracks in the sand. It’s comforting to know there are areas in the Lower 48 that are still unspoiled like this. Junior Bear’s Rating: 10 out of 10. 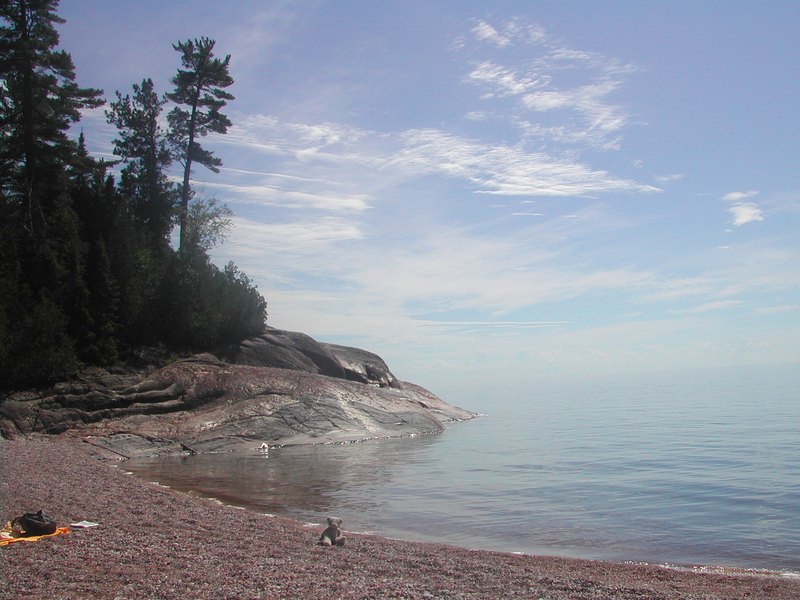 Located on the opposite (eastern) side of the Keewenaw Peninsula, just south of Copper Harbor. Beautiful sand. 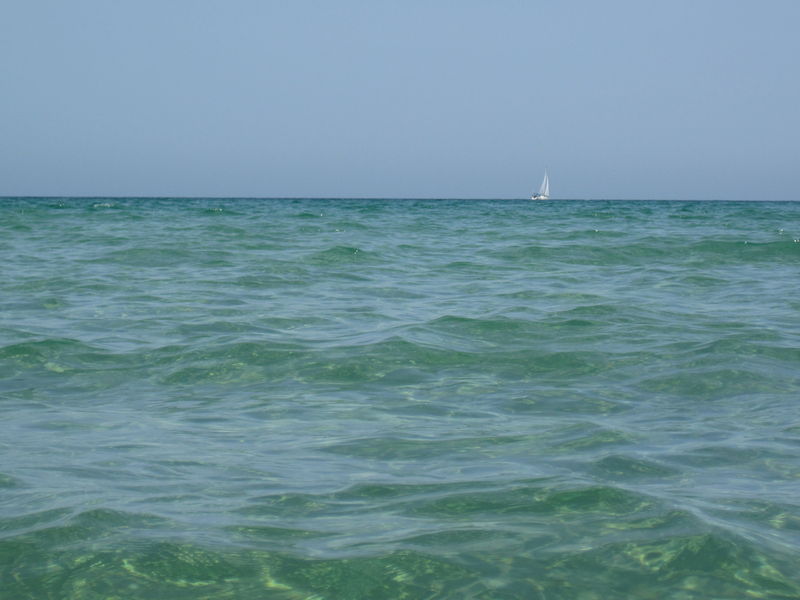 Shallow pristine water. 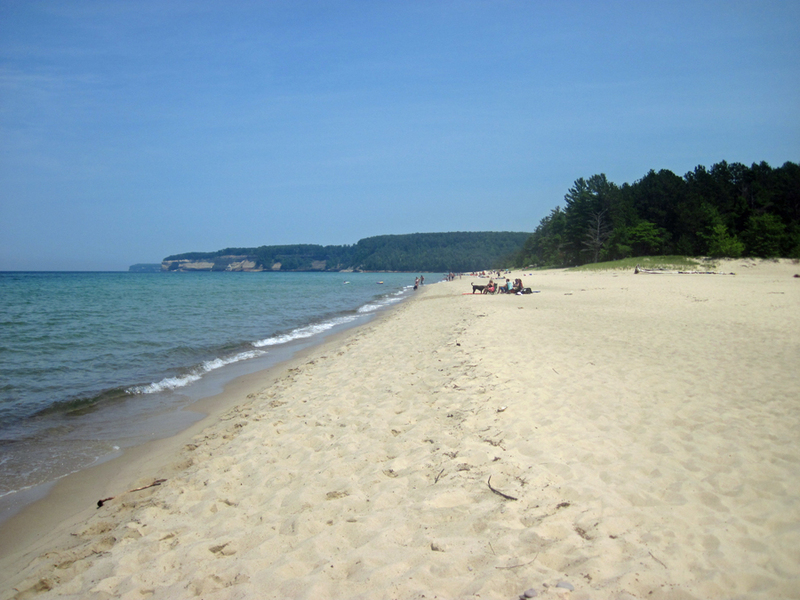 When I arrived, I was surprised to see it so uncrowded, especially just before the July 4 holiday. I was expecting this would be a perfect ten. In fact, is the the WORST BEACH EVER. The setting and water temperature were fine. The main problem, however, was the SAND FLIES. The #$%*ing little bastards were EVERYWHERE. Within seconds of coming out of the water, they’d swarm all over your ankles and legs, by the dozens, and start biting. It was enough to literally make you run to the car screaming, even before drying off. What a horror show. That’s probably why there were not people here. 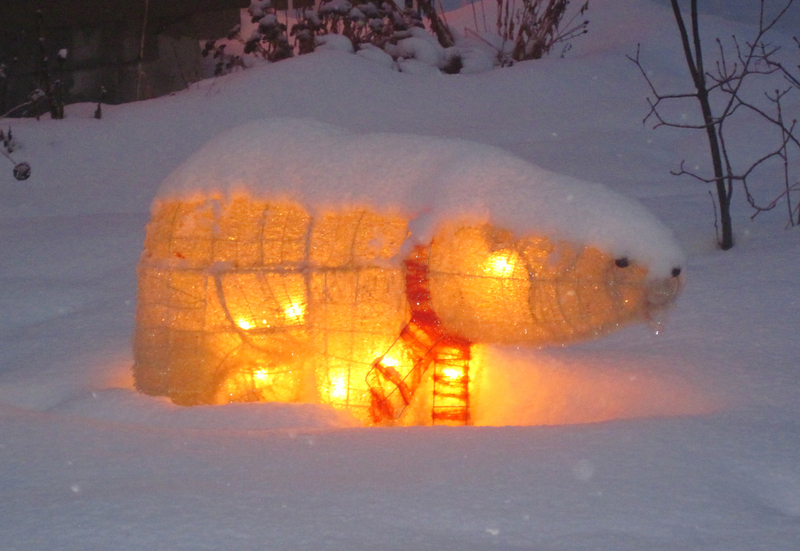 Junior Bear’s Rating: ZERO out of 10. 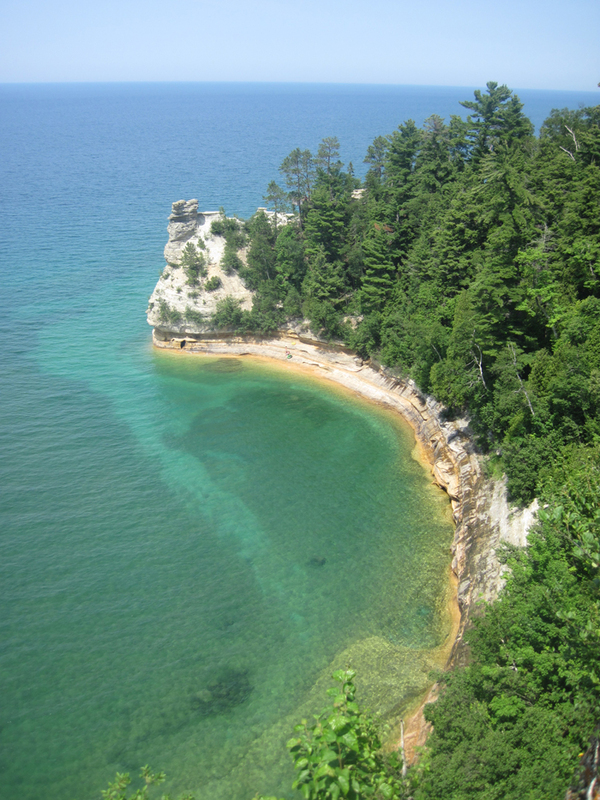 Located within the Pictured Rocks National Lakeshore, this is one of the top 5 most beautiful areas I’ve seen on Superior. It was a stinking hot day and the water felt so good to jump into. I stayed in as long as I wanted without getting cold, though my American fellow beach-goers were somewhat less enthusiastic about jumping in. I found the water had a nice turquoise color to it, that I hadn’t seen in any other parts of the lake. It almost looked Caribbean. As an added bonus, there was Miners Castle, an interesting rock formation just down the road. The entire coast in this area is spectacular. I guess this is why they made it a protected National Seashore. I definitely want to come back and explore this area some more. Big Water, Not Quite Superior. 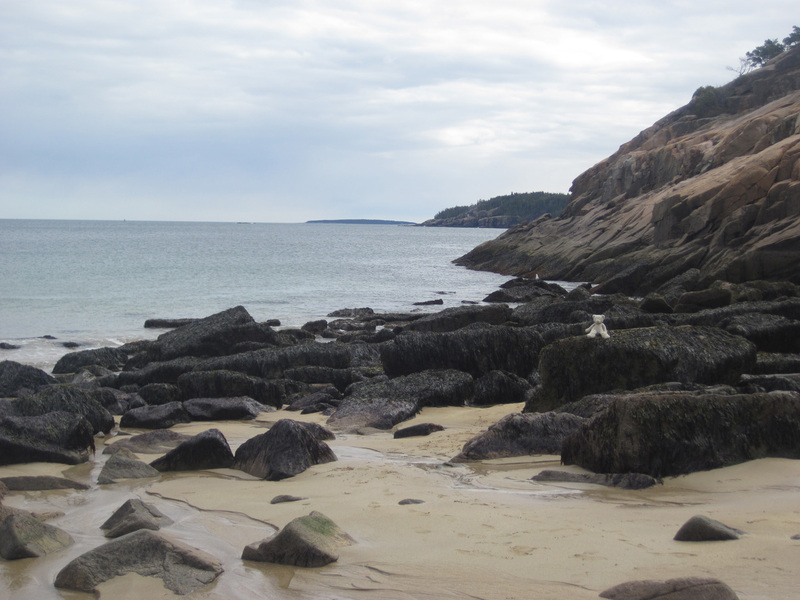 Last week, I was at Acadia National Park in Maine, and found the shoreline quite similar to that of the northern Great Lakes. Same blackened rocks. 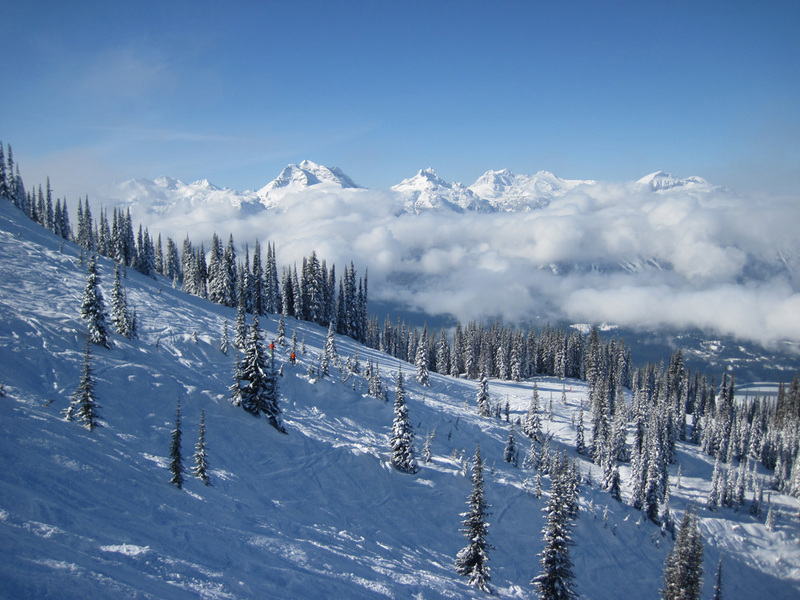 Same spruce trees. Even the cold damp weather was the same. For all intents and purposes, this could have been Lake Superior. 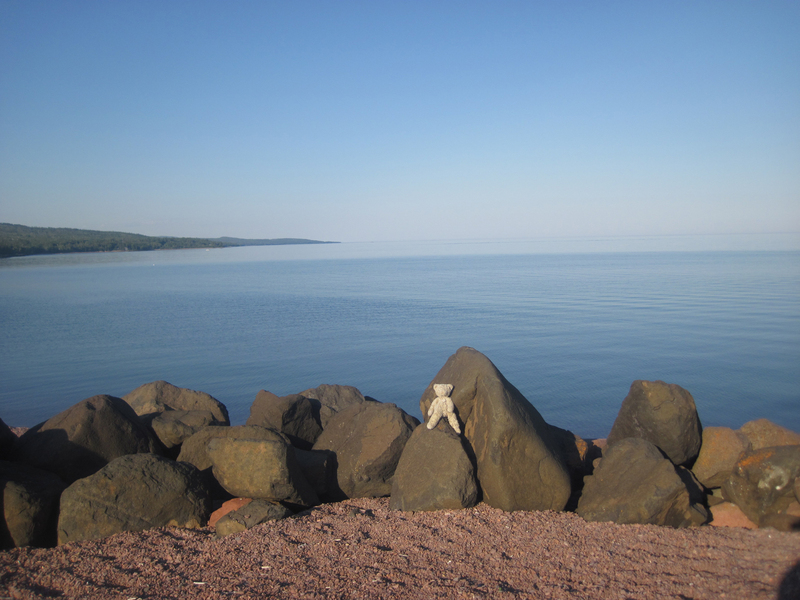 I was thinking, maybe I could stare out at the huge expanse of water, and feel that same “Zen like” state of relaxation that I feel when I sit on the North Shore. And it was beautiful….I admit. I tried to relax and let my mind go. But I just couldn’t “feel it”. It felt claustrophobic. Probably because of the dozen or so people I was sharing the beach with at the time, even though it was the off-season. Or knowing that this is only a tiny pocket of wilderness, only a few miles across, right in the middle of the densely populated Atlantic seaboard. 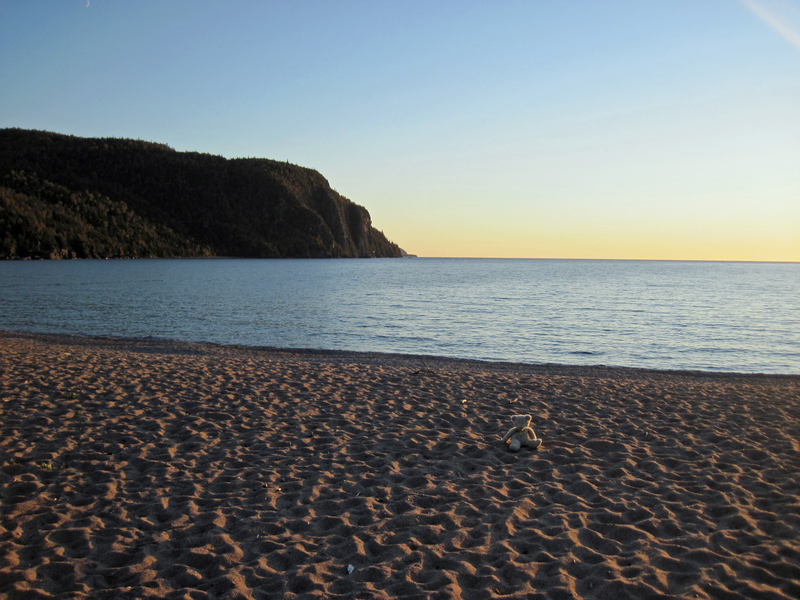 Where every other square inch of shoreline is developed or inhabited by hotels, inns, summer cottages, tea rooms, antque stores and bed and breakfasts. With big cities like Boston, Montreal, New York, are all within spitting distance. Where there is rush hour traffic along the Coastal Highway all summer, as millions of tourists flock to the coast. Where you only have to go a few miles to find the nearest fast-food joint, or T-shirt store, or Factory Outlet mall. 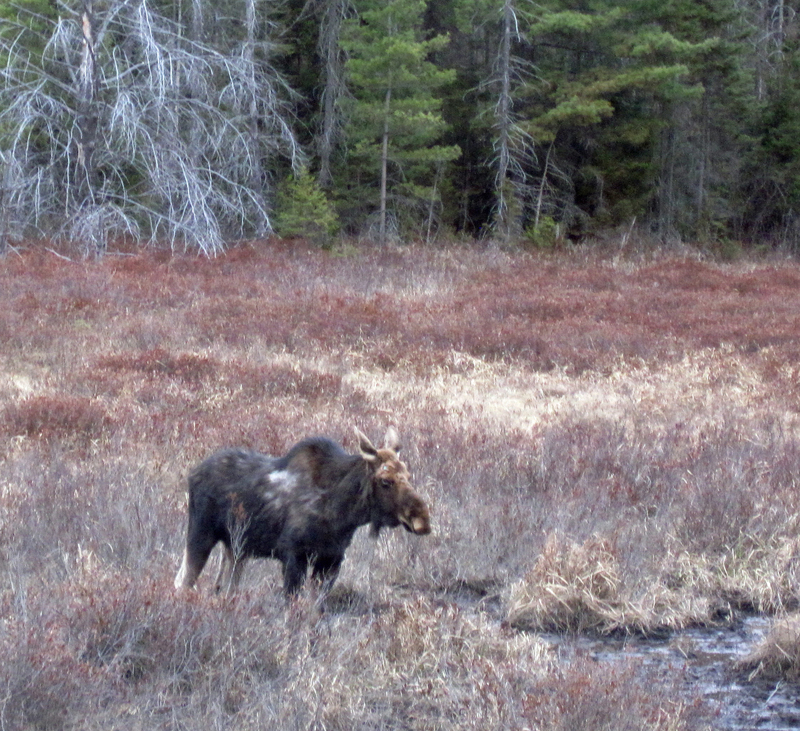 Where there are no moose, no wolves, no pristine trout streams. No thousands of lakes, many of which never even see a fisherman for years. 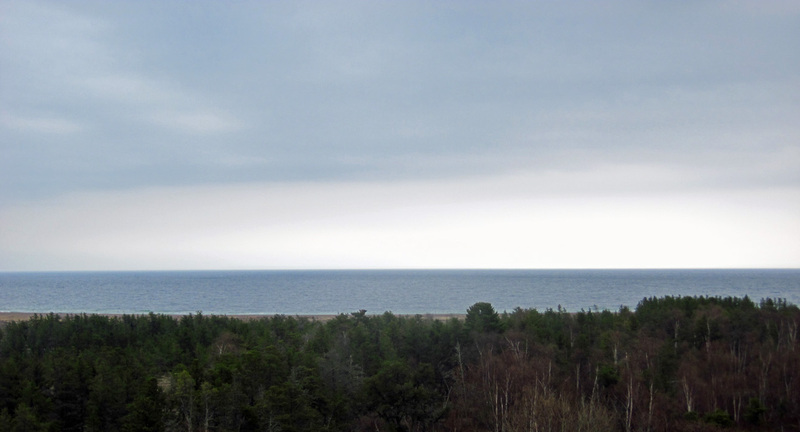 No isolated roadless stretches of shoreline, no huge tracts unpopulated of Crown Land . No sense of awe you get at being surrounded by a huge expanse of wilderness. No feeling of being “up there”, away from it all. 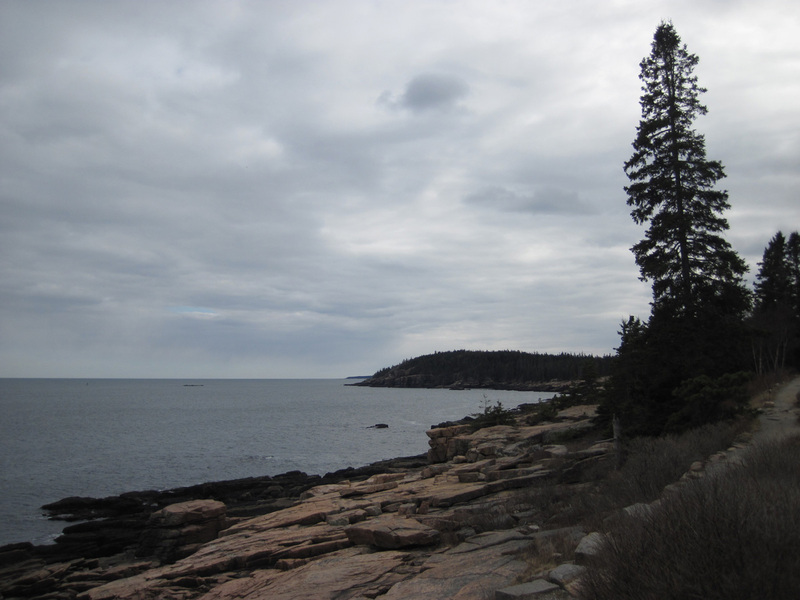 So, yes, I’ll admit the Coast of Maine is beautiful, sitting on the edge of a big expanse of water. And I’m glad to visit it. But it’s just NOT quite the same. 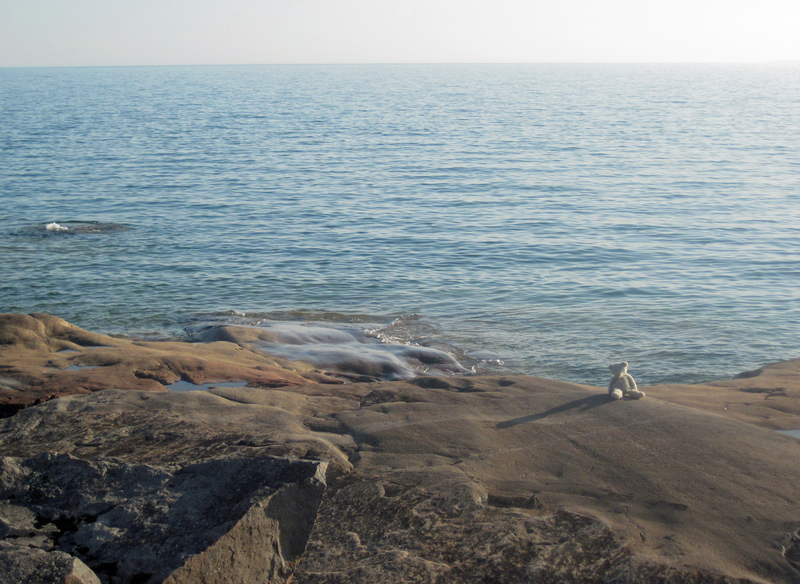 Give me Lake Superior, any day. 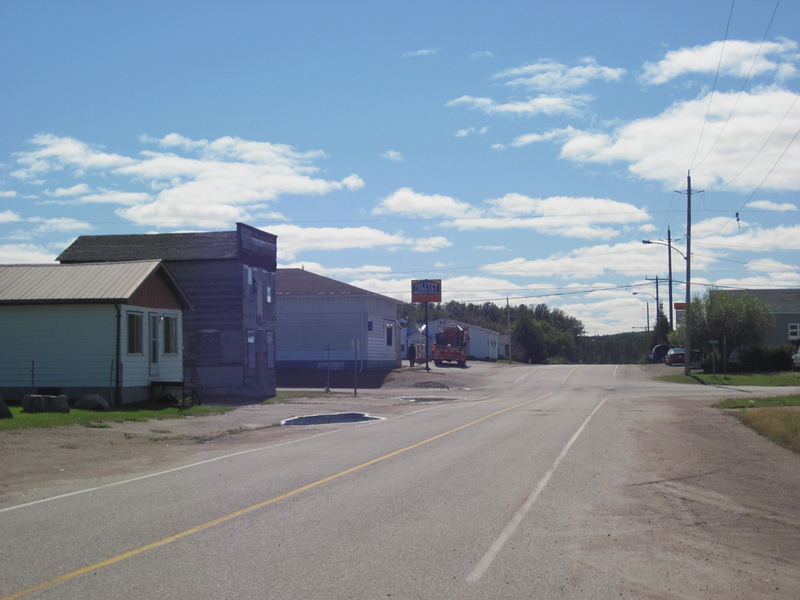 This is downtown Espanola, a mill town located just west of Sudbury, near the north shore of Lake Huron. 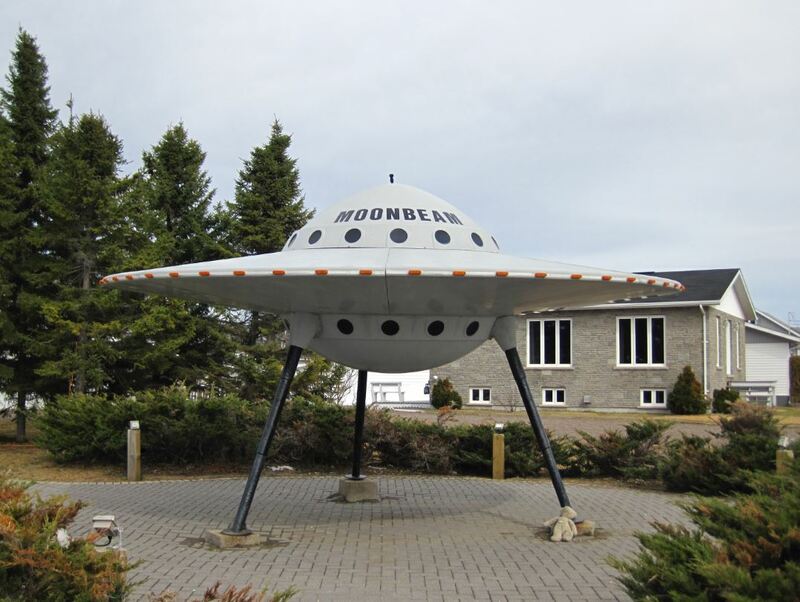 This town is the gateway to Manitoulin Island. It’s other claim to fame is the paper will, which apparently spilled a bunch of toxins in the Spanish River back in the 80s and killed off tons of fish. People still talk about it. See this lake? It’s pretty big…you almost can’t see the other side. 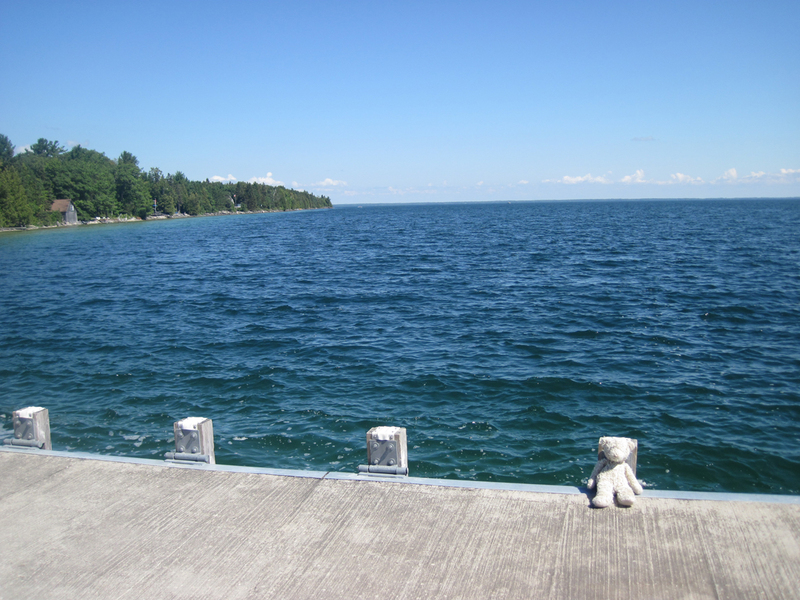 This is Lake Manitou, which is located on Manitoulin Island, which itself is located in Lake Huron. 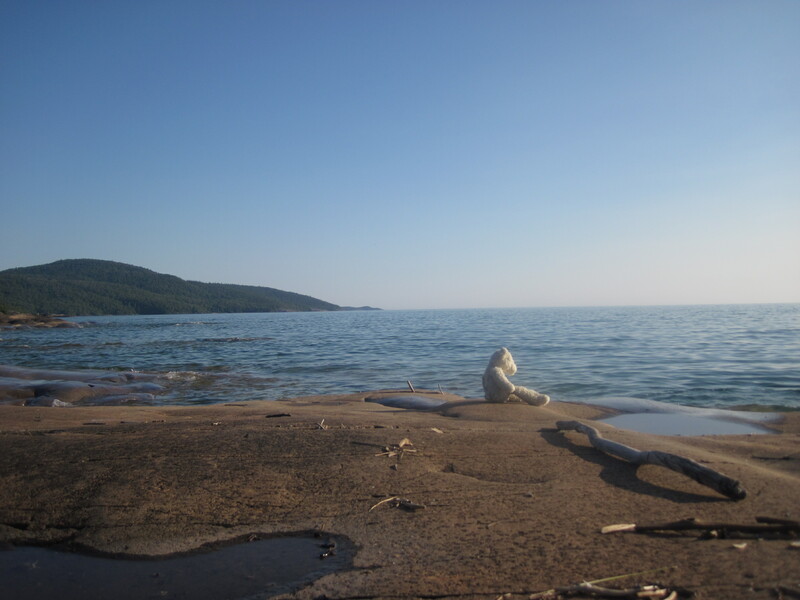 Which makes this lake the worlds largest freshwater lake, within a freshwater lake. 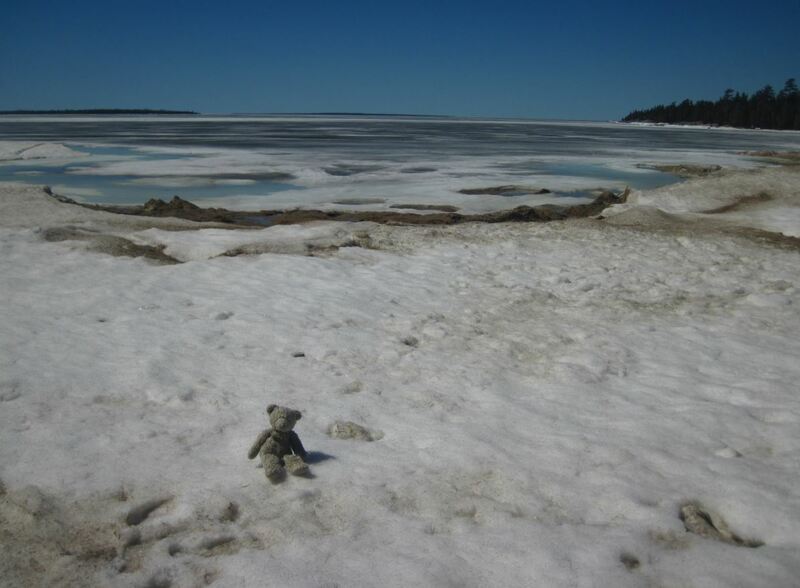 Here’s Lake Huron itself, on Providence Bay on Manitoulin Island. It was stinking hot…and the water was swimmable. Just barely. 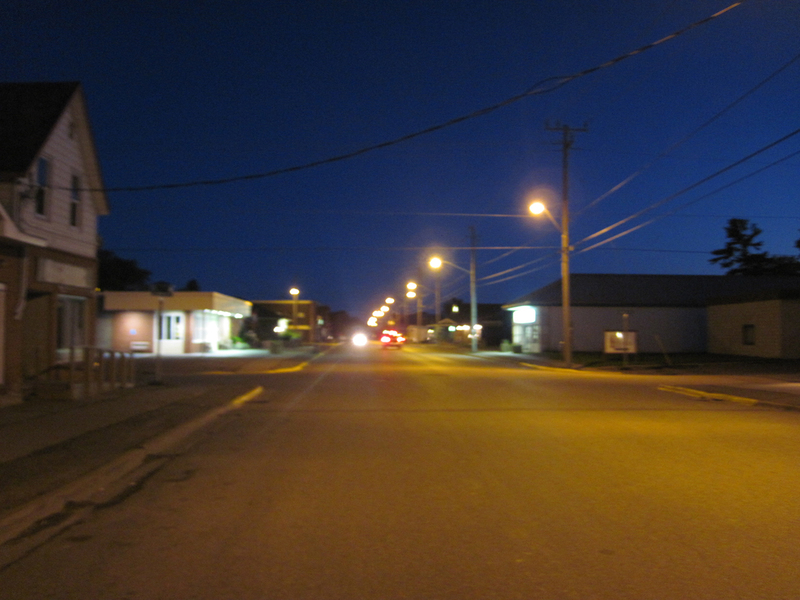 This is Downtown Thessalon, on a Saturday night. It just doesn’t get any better than this. 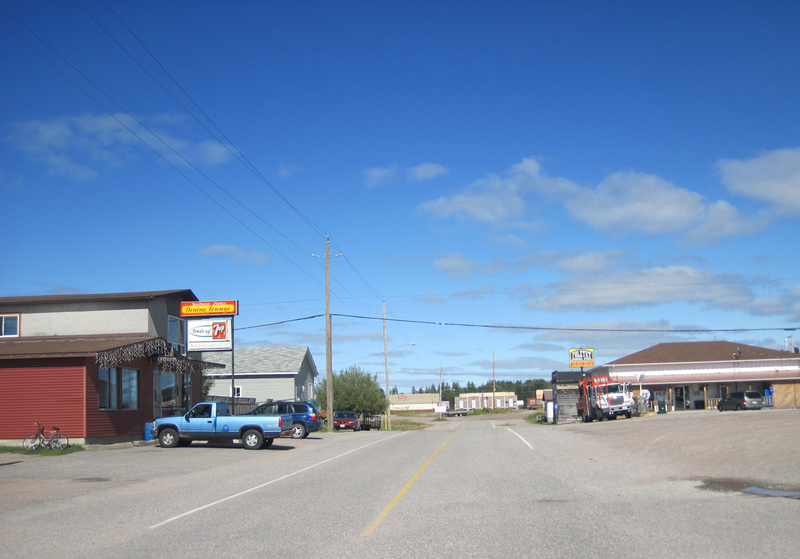 Here’s Wawa (two hours North of the Soo). I’ve blogged about it before. 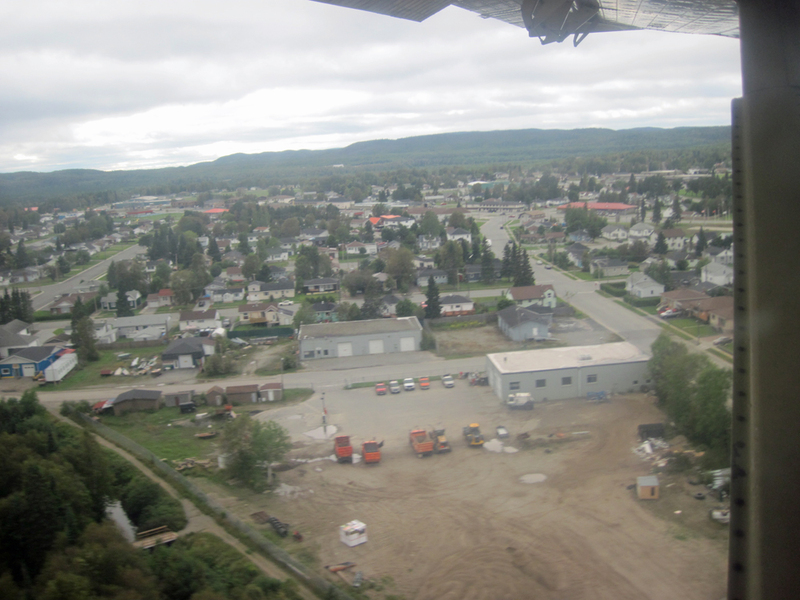 This is an aerial view from the bush plane that returned me back from my fishing trip. 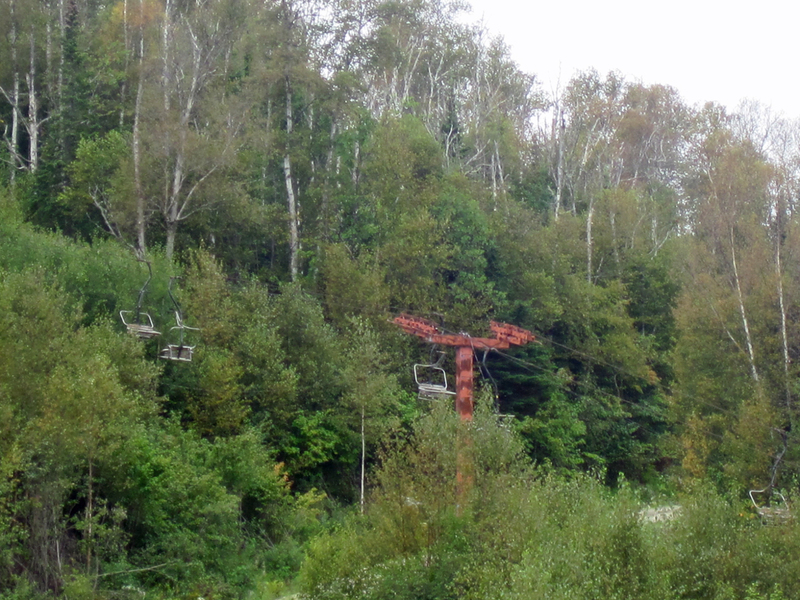 Just outside of Wawa is this old ski hill. 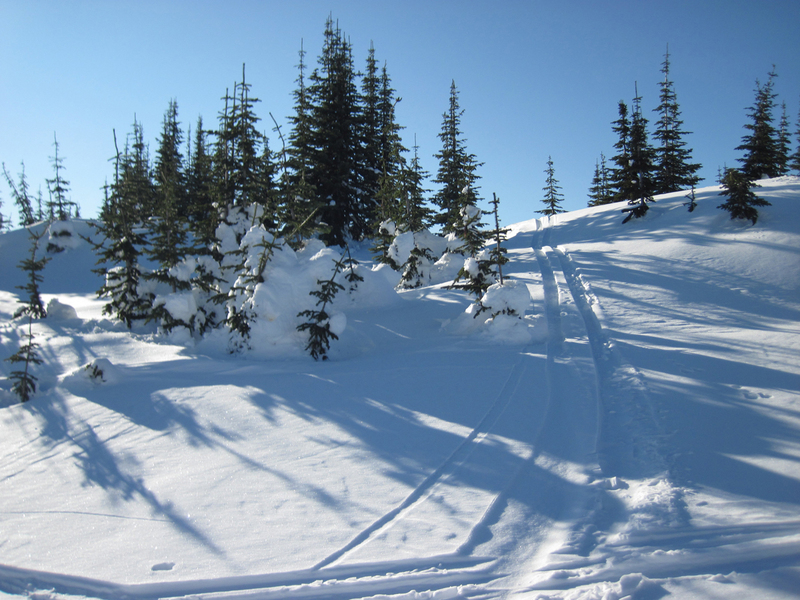 It boggles my mind…no matter how remote, or how small a town is…you can always find some kind of ski hill of some sort. Seems this was the thing to do in the 60’s and 70’s. But now, as course, as you can see from the trees, it’s long since been abandoned. A sign of prosperous times long since past. 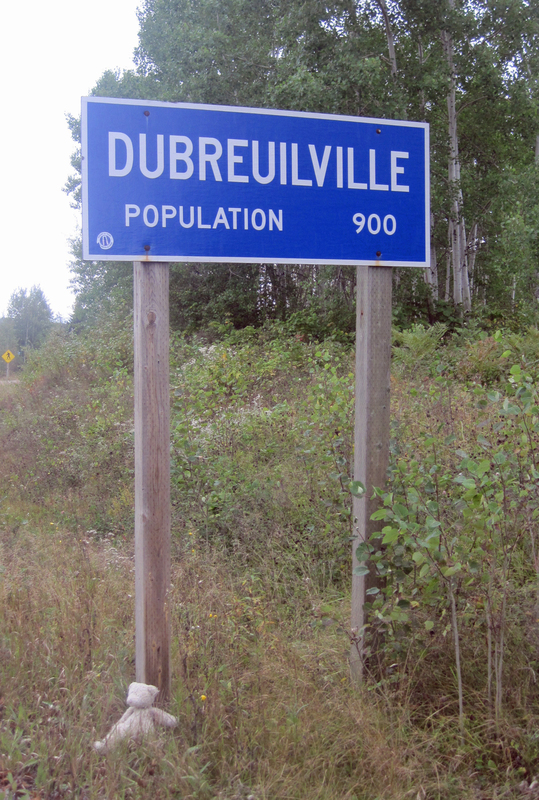 Next, is the town of Dubreuville. This is your proverbial company town, named after the lumber company which founded it. 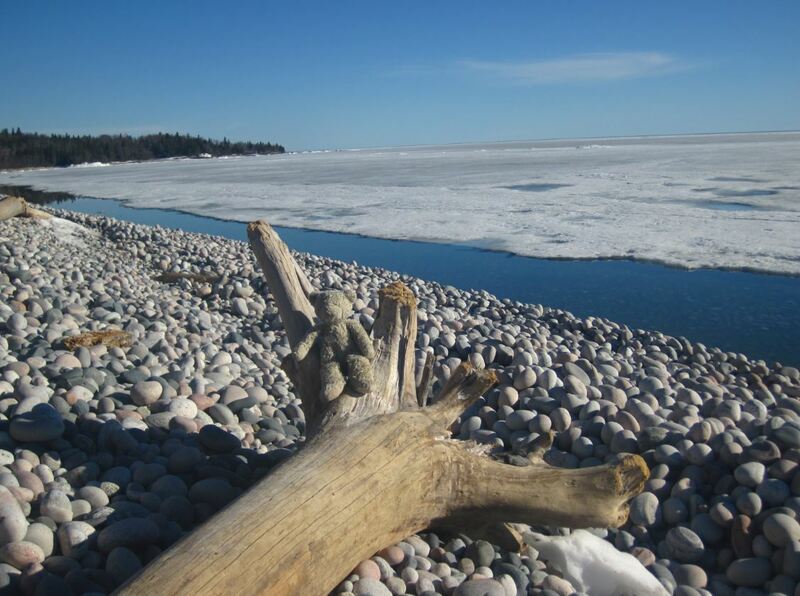 It’s on the end of a 30-km dead-end road, Northeast of Lake Superior. I wasn’t really excited about being here. I just went to say I’d been. Another place to tick off on the map. I must admit, I’m a bit biased against the town. 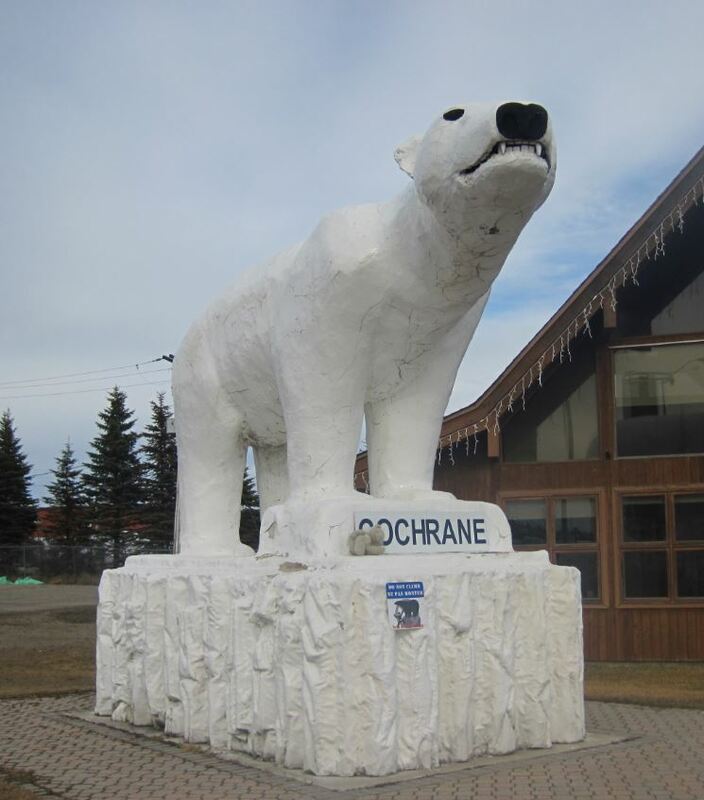 They’re located south of the fishing lodge I like to go to, which is in a protected wilderness area. 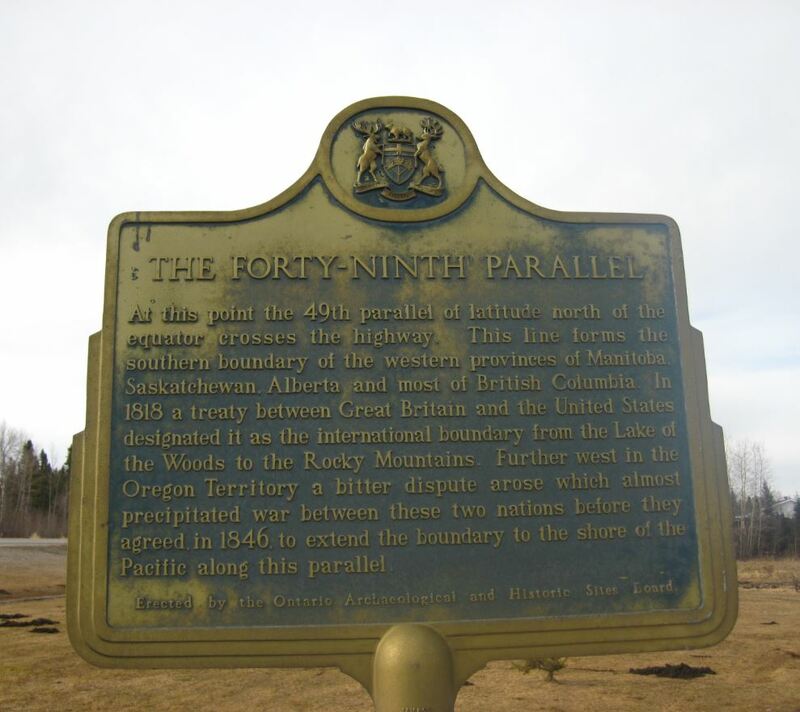 But the Dubreuvillers apparently want to change that, and gain access to the lake with ATV trails and such. 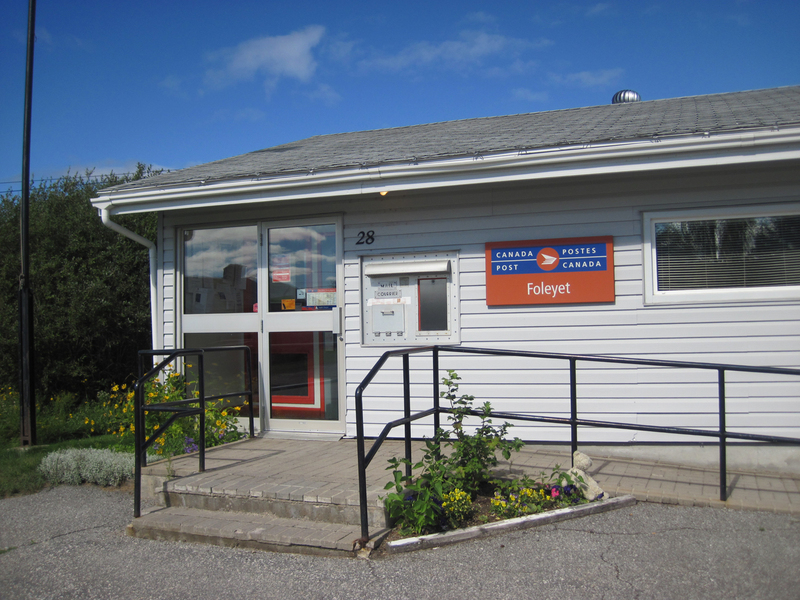 They’ve been feuding with the lodges and the provincial government for years. I have no sympathy for Dubreuville. 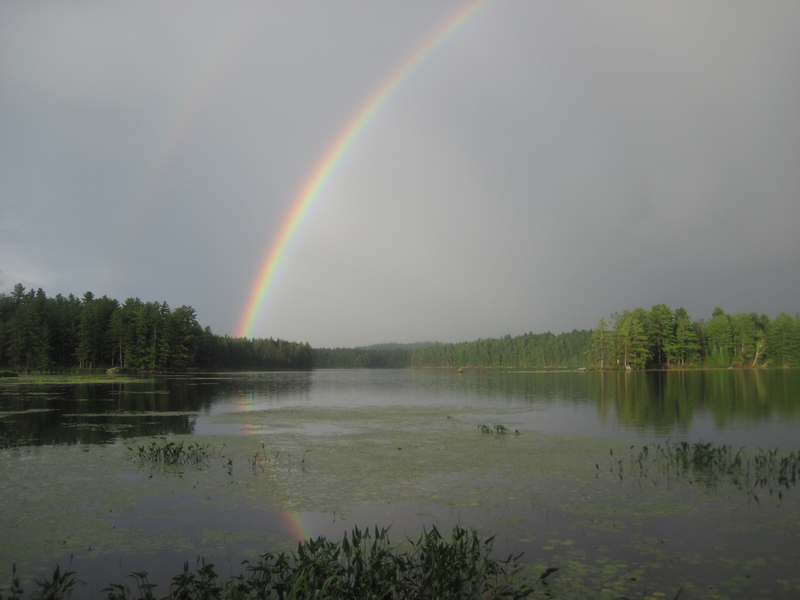 There are hundreds of miles of trails, and hundreds of other lakes in the area. If they’ve already spoiled those areas with over-hunting and over-fishing, that’s their problem. Don’t ruin the few remaining unspoiled areas. Leave them alone, I say. Anyway, the town isn’t doing that great. 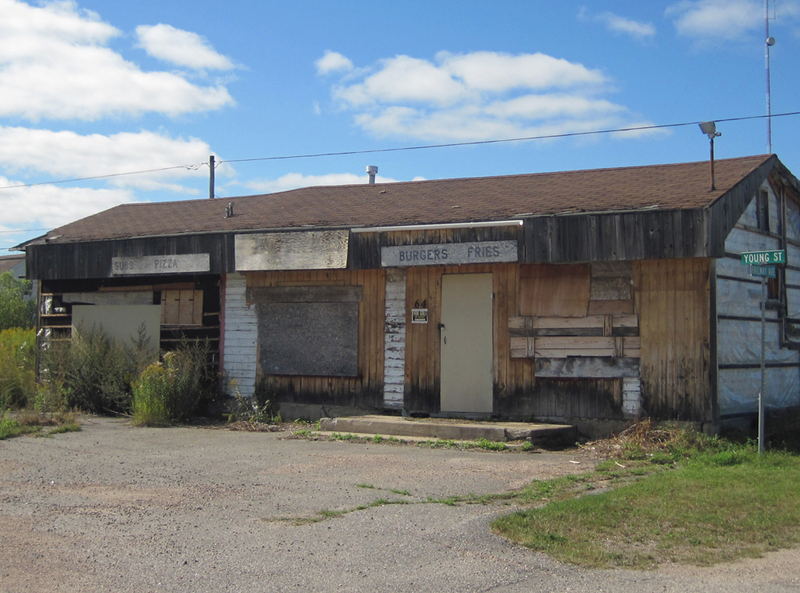 The only industry is the sawmill, which recently shut down because of lack of a lumber supply. You can already see the signs of decay (empty apartments, etc.). This might become another ghost town, if things don’t pick up. 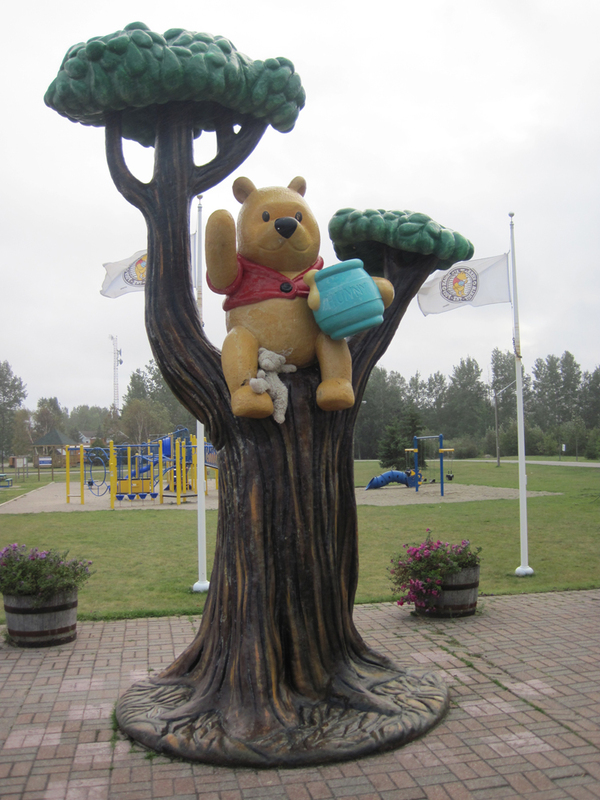 I’ve also blogged about White River before, which is the birthplace of Winnie the Pooh. Junior Bear and I always stop and pay our respects at the Pooh statue. 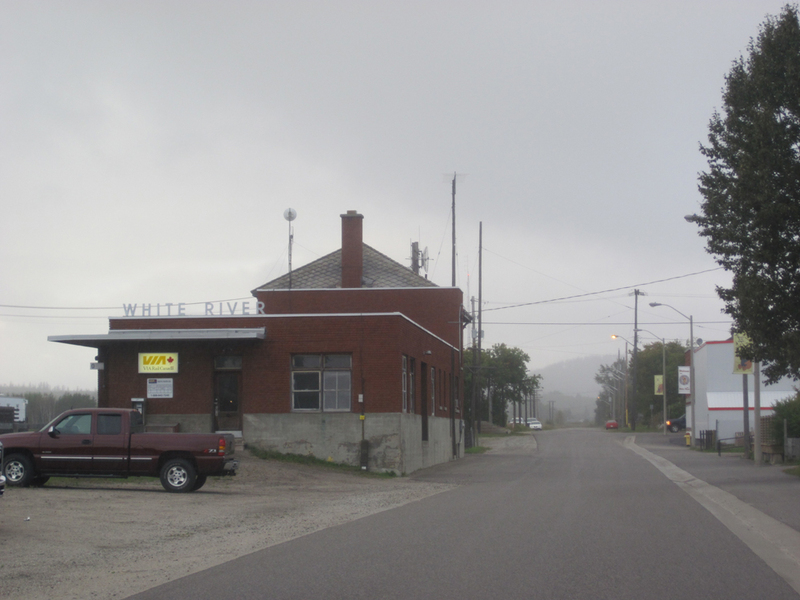 White River is basically a railway town in the bush Northeast of Superior. And it, too, has seen better days. 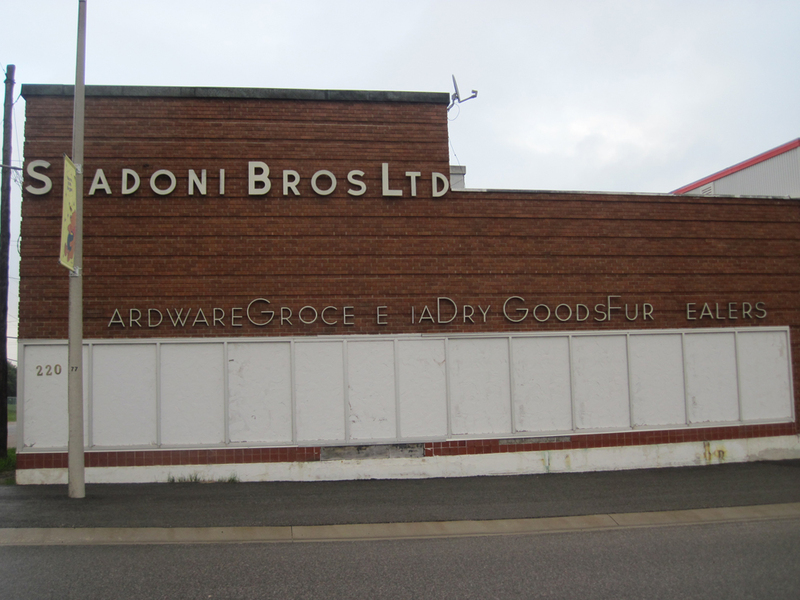 I wonder what it was like when this hotel was still running, or the S_andoni Bros. department store was still open? Though I hear the town is starting to take off again. 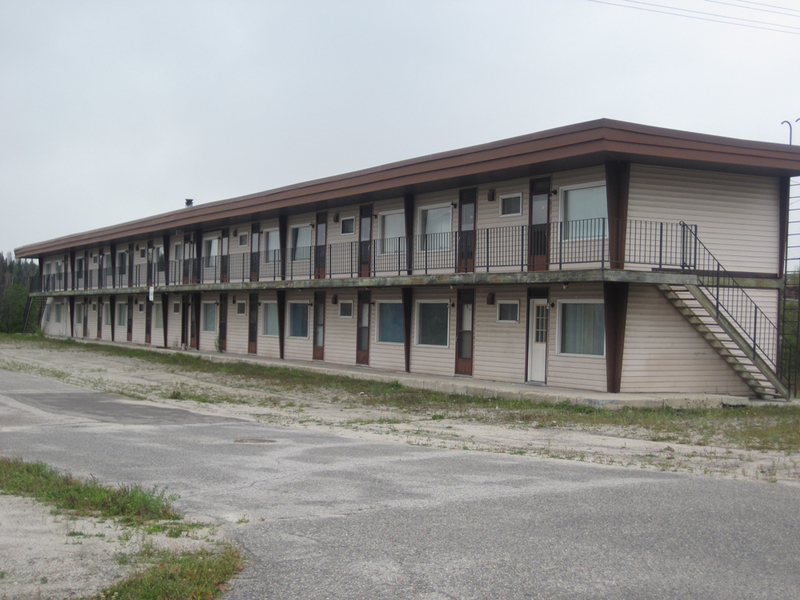 They just got a contract for some air service to some fishing lodges, which means more people will be staying in the hotels there. 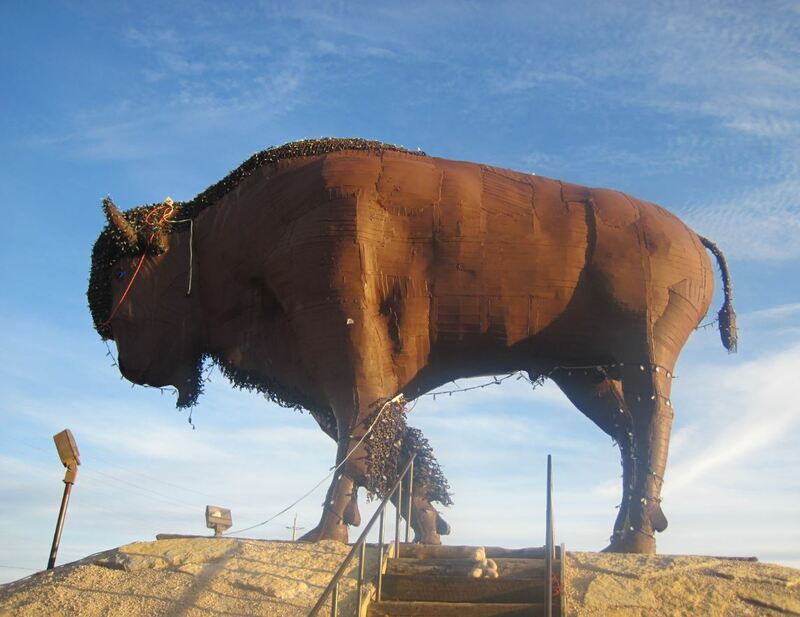 Tourism in the area is starting to grow. I wish them well. 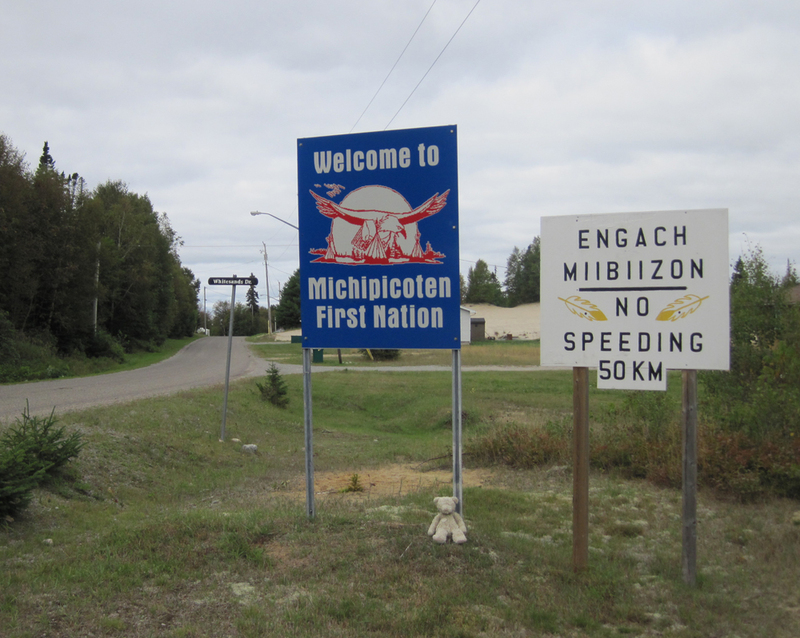 Here’s the Michipicoten First Nation village, on the Northeast shore of Lake Superior, just outside of Wawa. 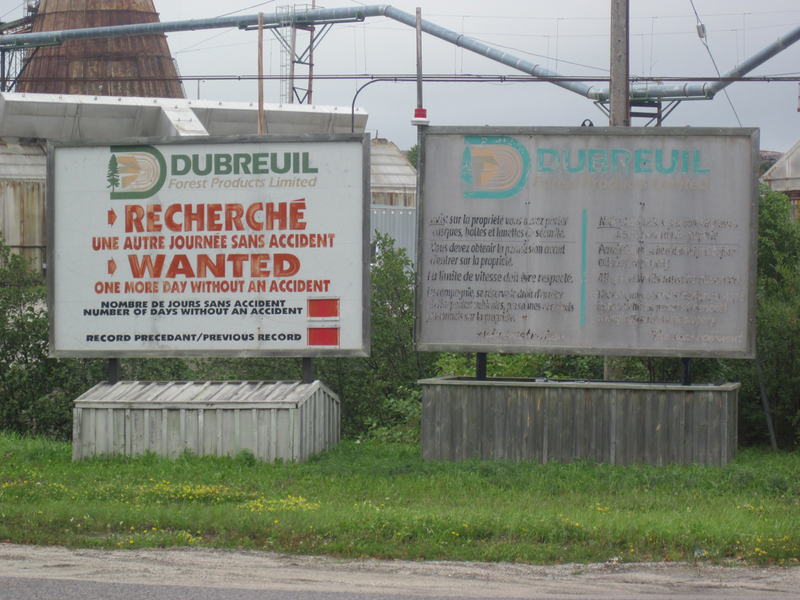 I like the bilingual signs…there were a whole bunch of the on the road, welcoming tourists. It felt friendly. 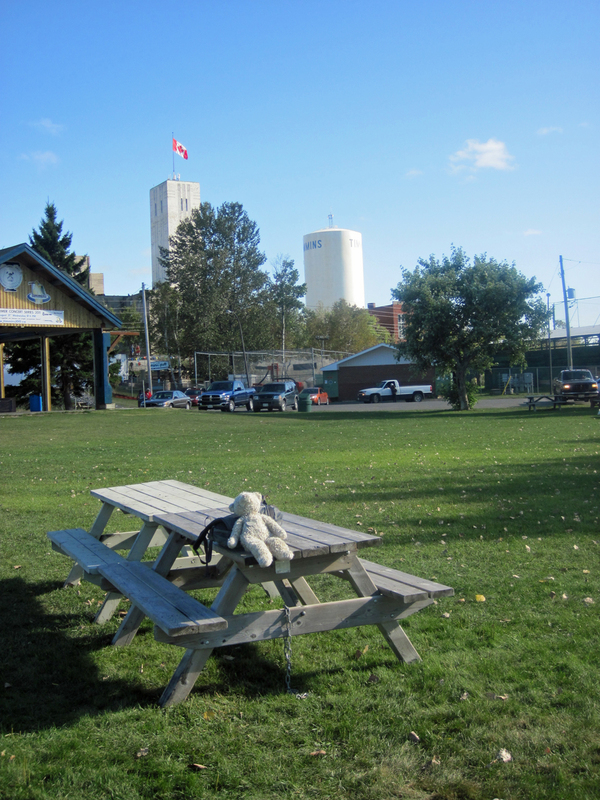 At the end of the the village, there is a picnic/camping area right by Superior. The signs indicate this as a “sacred place”. Given the wilderness setting and the beauty of the place, I have to agree. 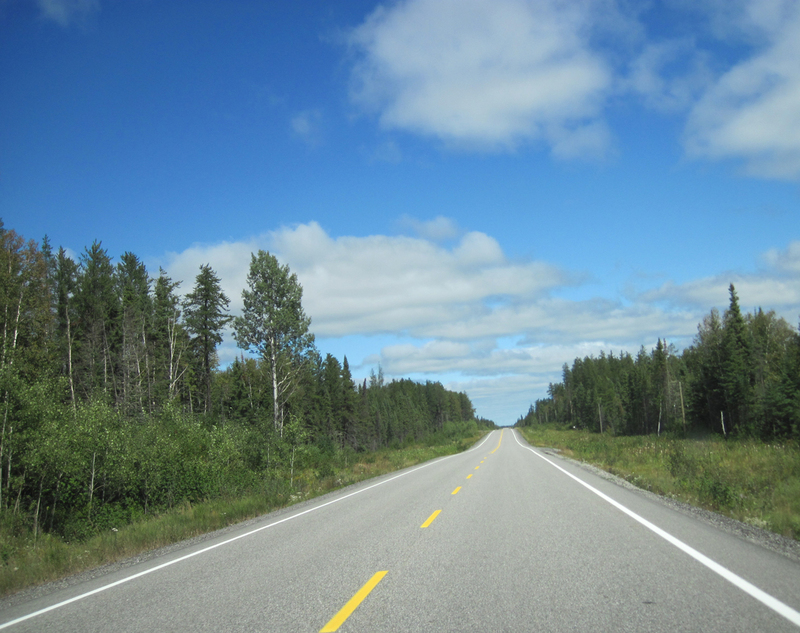 Highway 101 crosses the Northeastern part of Ontario. 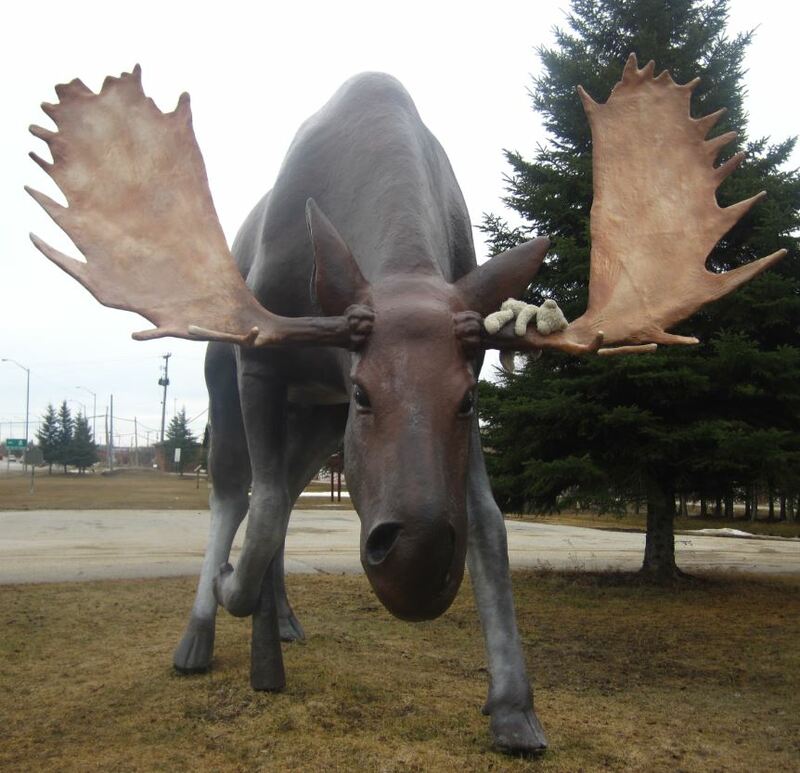 This is typical, when driving through Northern Ontario. All you see are …trees, trees, trees…. 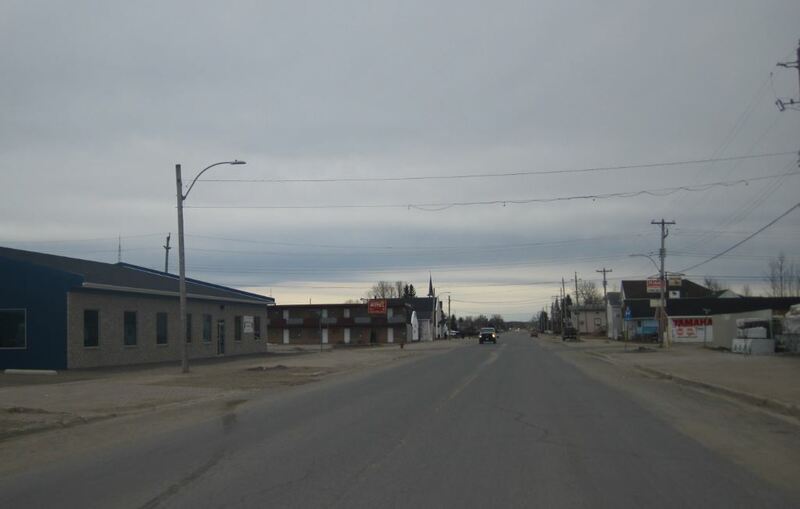 And then every hundred kilometers of so, you come across a town, like Foleyet (pop. ~ 200). 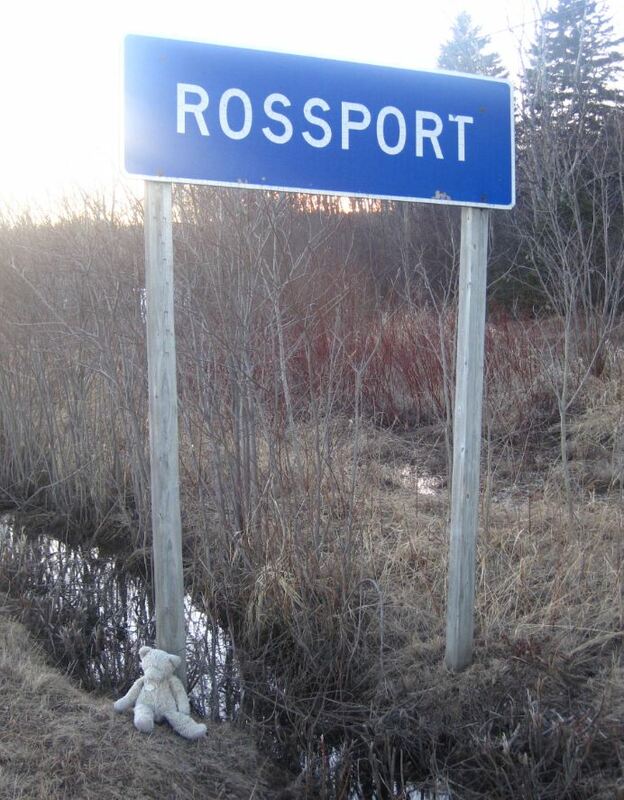 The is another railway town, in the middle of the bush. (Not exactly a prime cottage country/tourist area). I wonder how long ago this burger/fries restaurant was open? 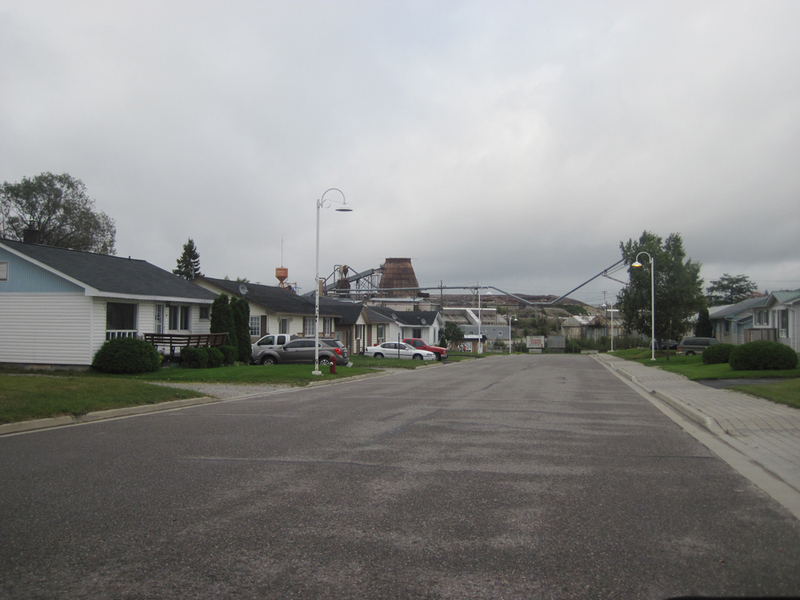 After hours of driving through the bush, I finally hit my first “Big City”: the town of Timmins (pop. 43,000). 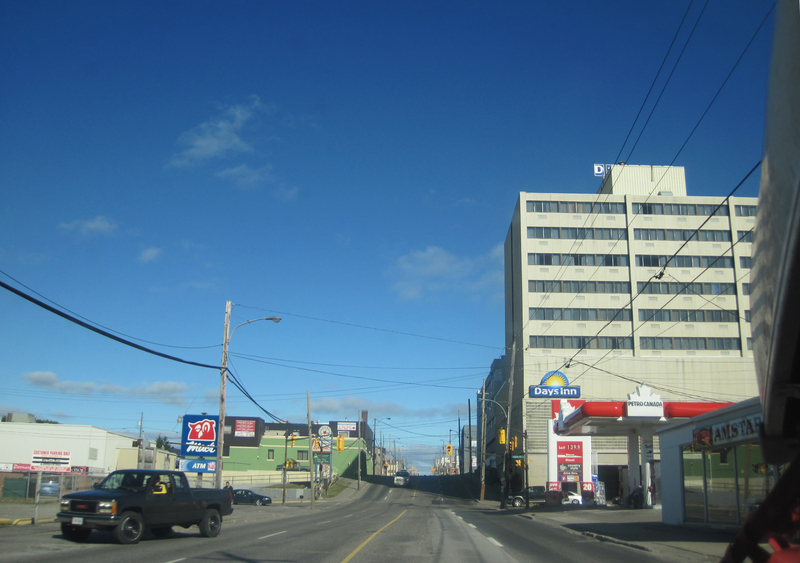 It was a novelty to see a “real city”, with multiple traffic lights, a water tower, and “high-rise” buildings greater than four storeys. 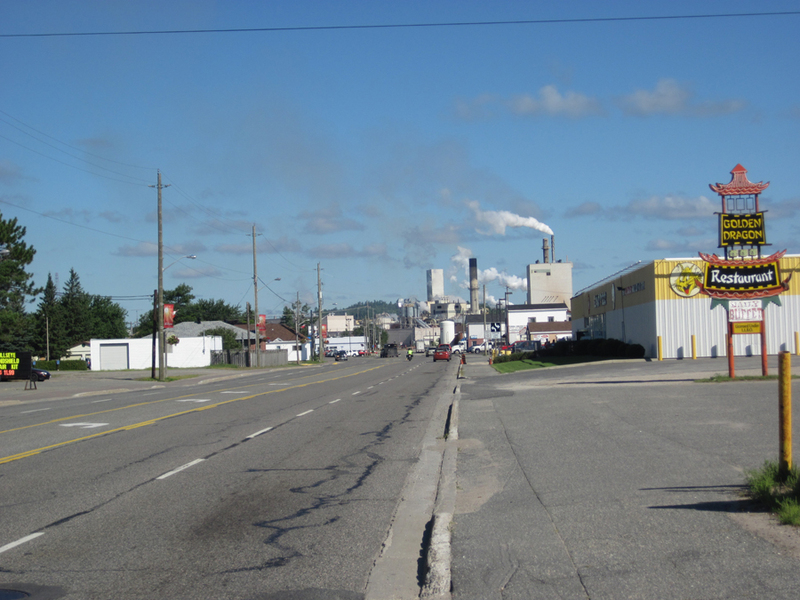 Timmins’ claim to fame (aside from being the birthplace of Shania Twain) is it’s gold mining, which is still on-going. 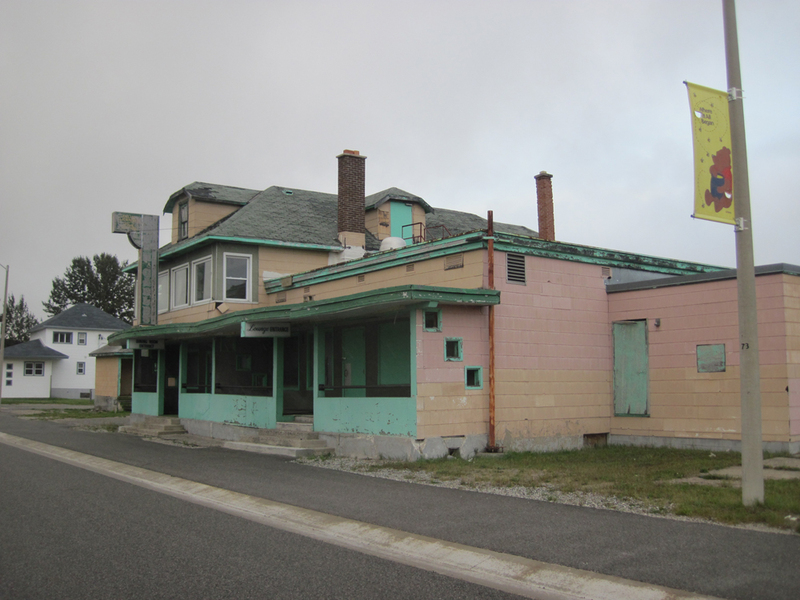 You can also see old derelicts too… This is a boom-and-bust town. 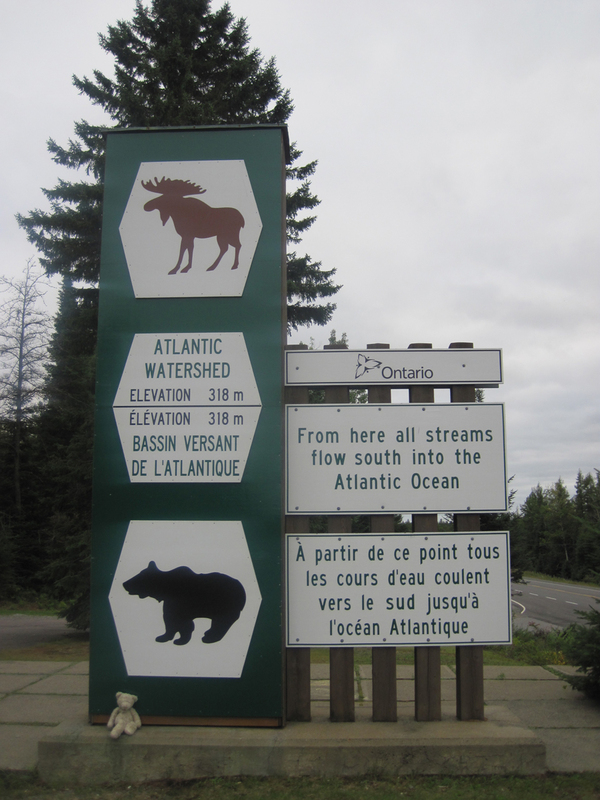 Heading home, I always like to stop at the Arctic Watershed: the point at which the water drains into either the Great Lakes, or Hudson’s Bay. 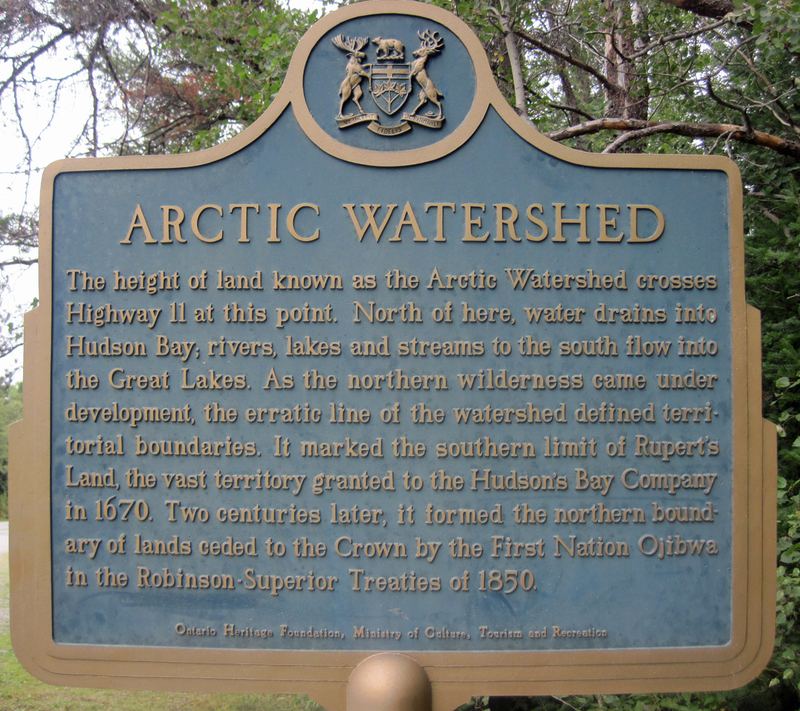 Point of trivia: the Arctic Watershed lies mostly in Canada, but it also includes parts of the States (mainly Northern Minnesota and North Dakota). I always feel sad heading south of the watershead, because it means I’m leaving the “North” and my vacation is ending and soon I’ll be home.